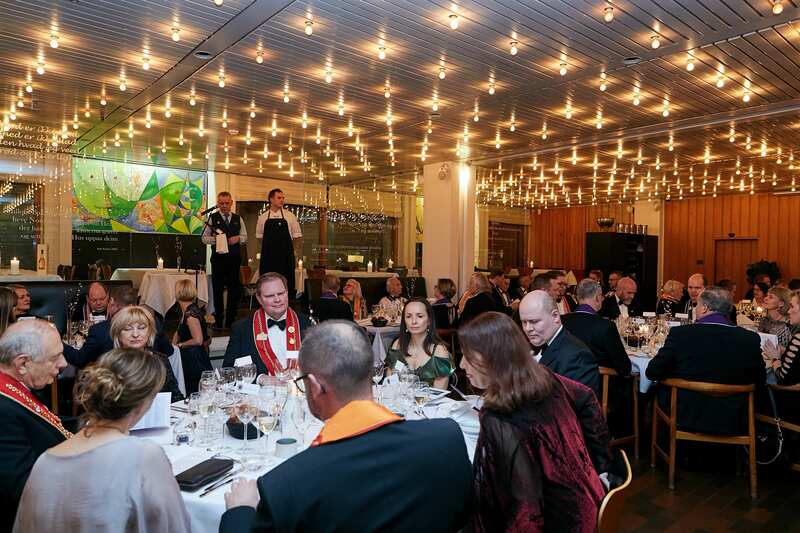 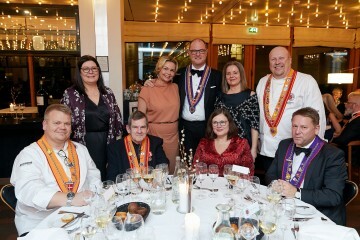 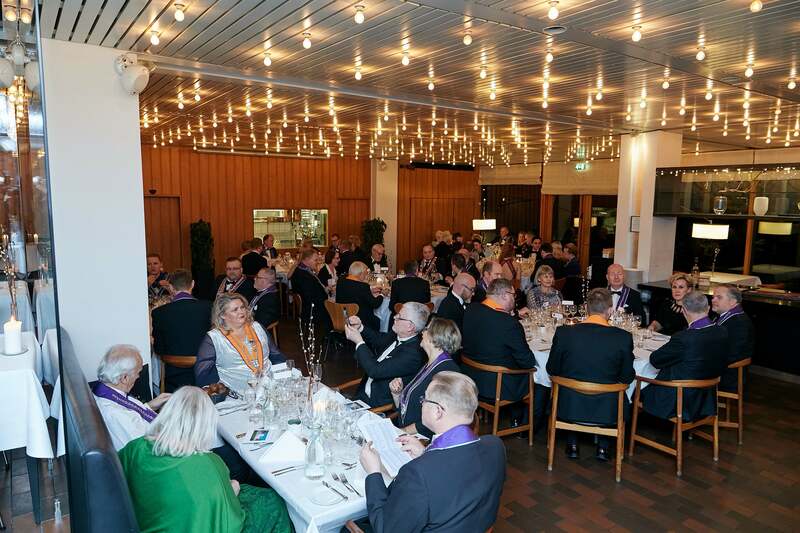 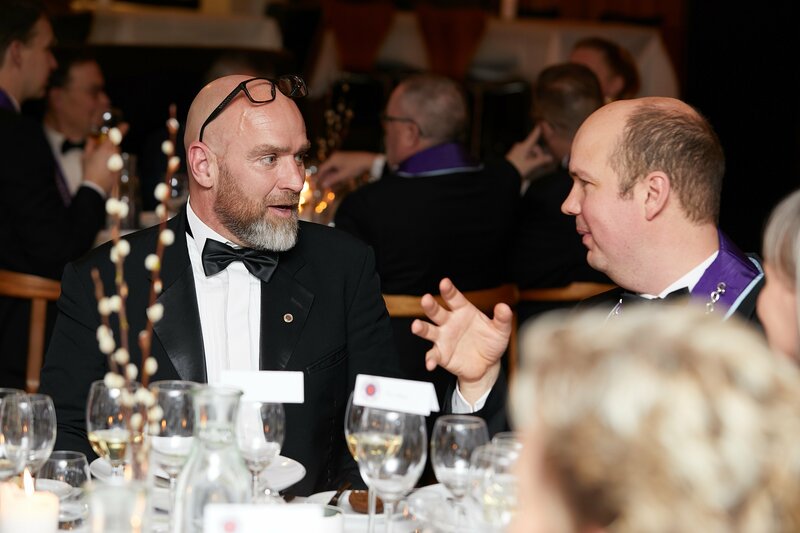 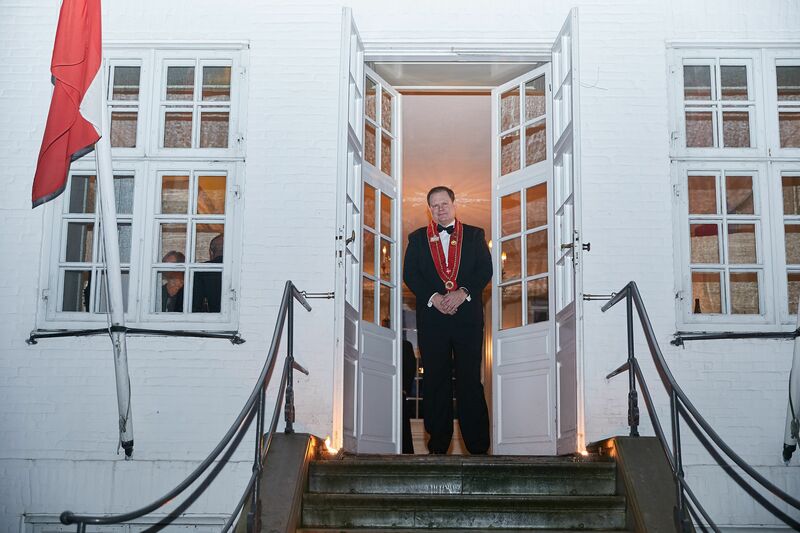 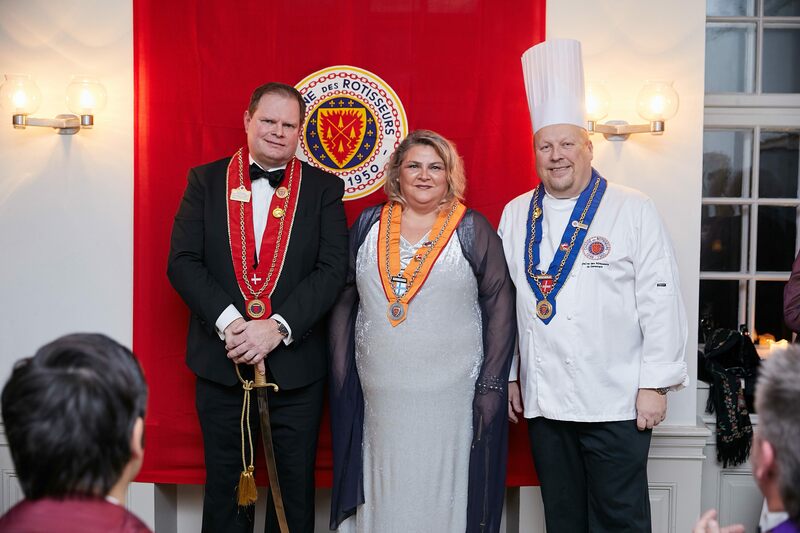 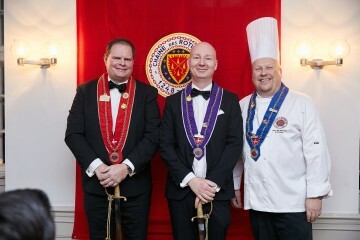 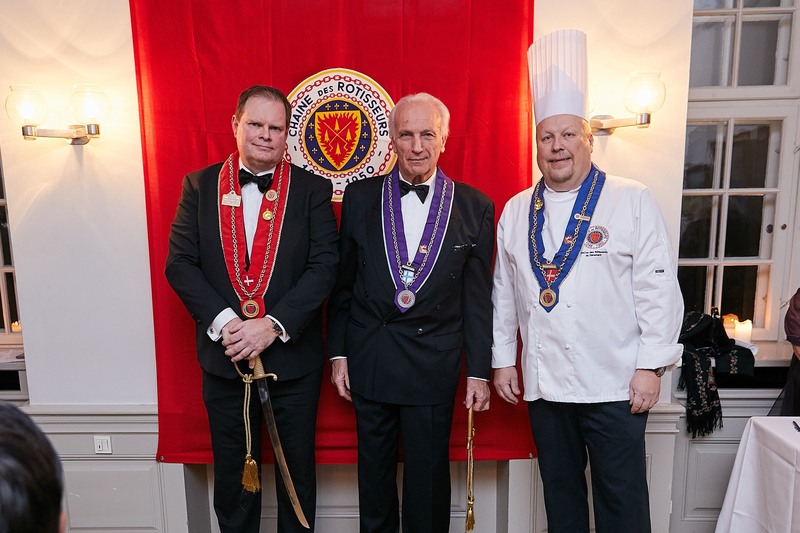 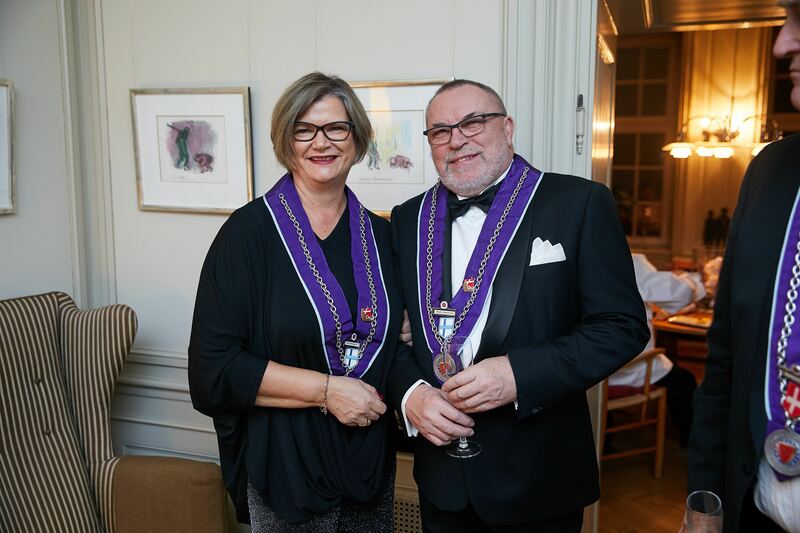 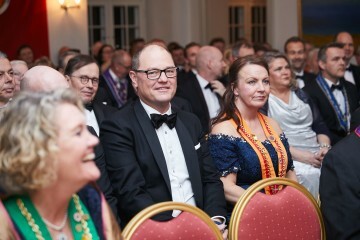 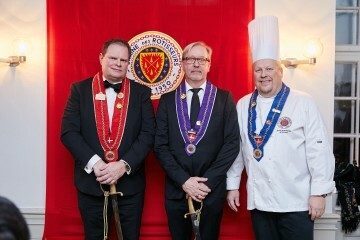 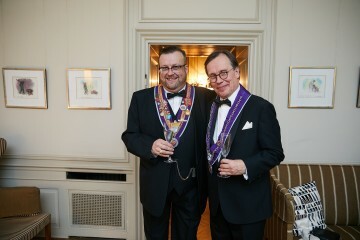 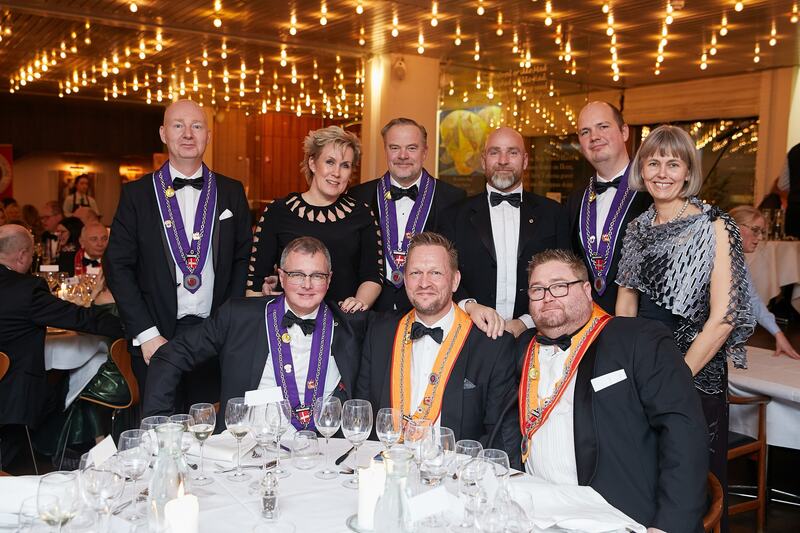 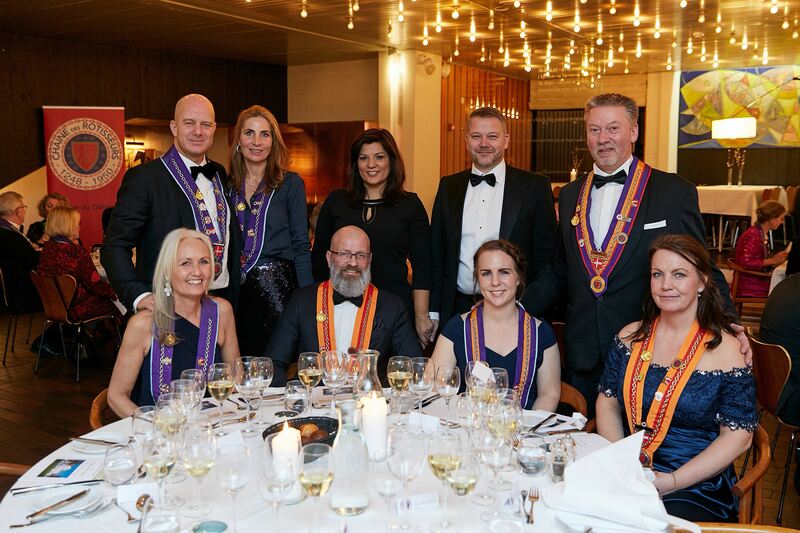 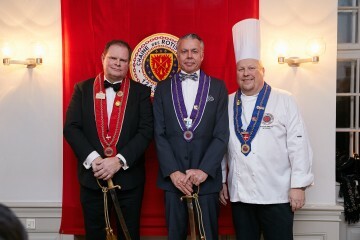 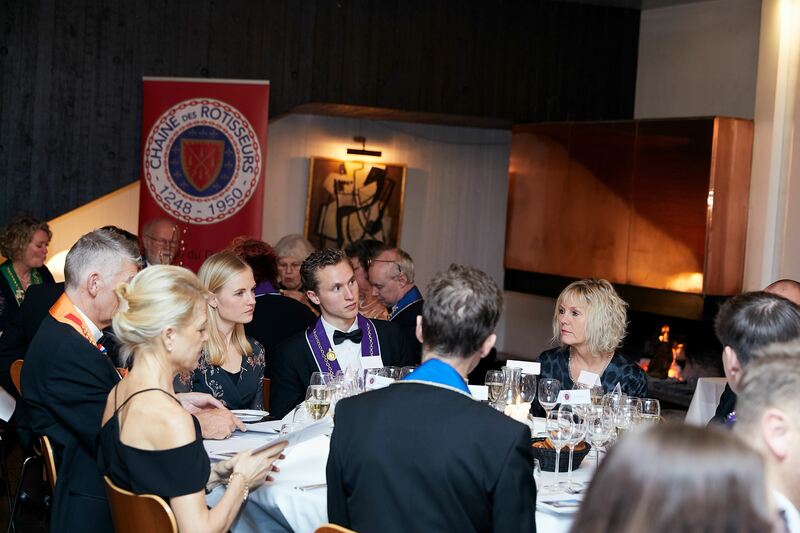 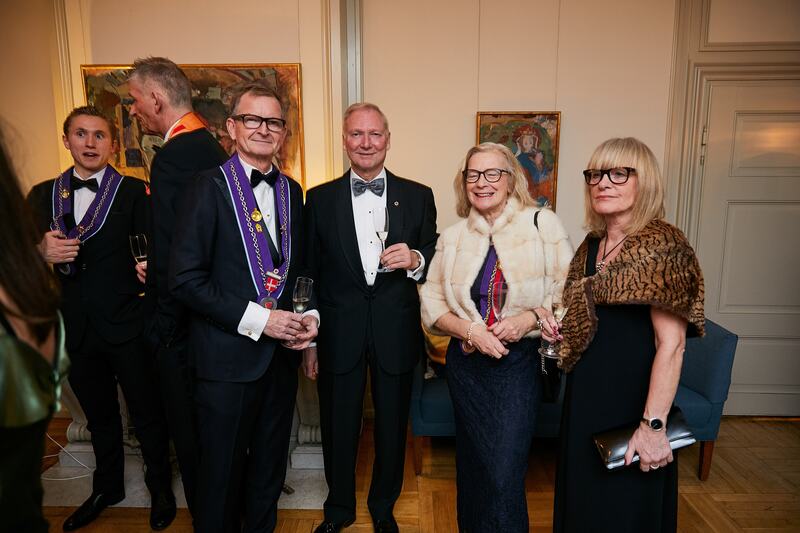 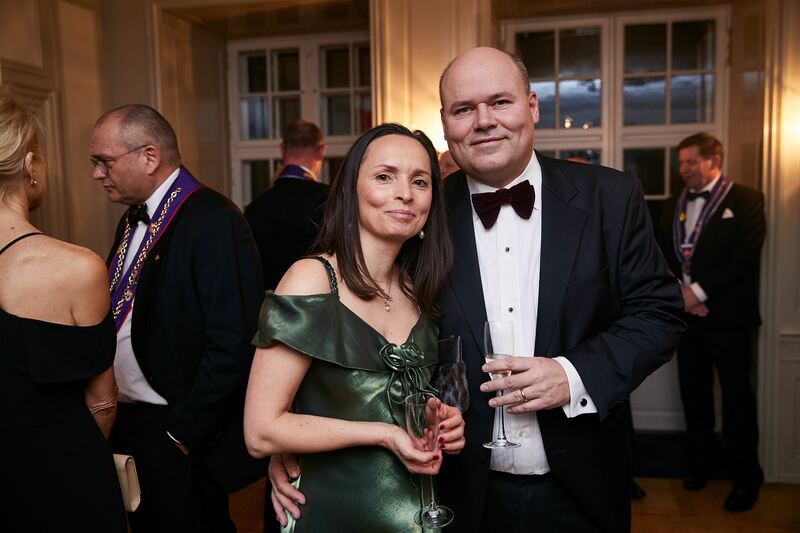 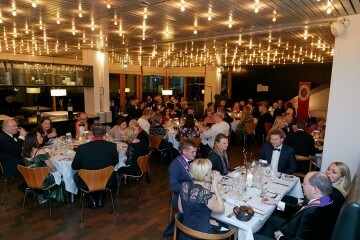 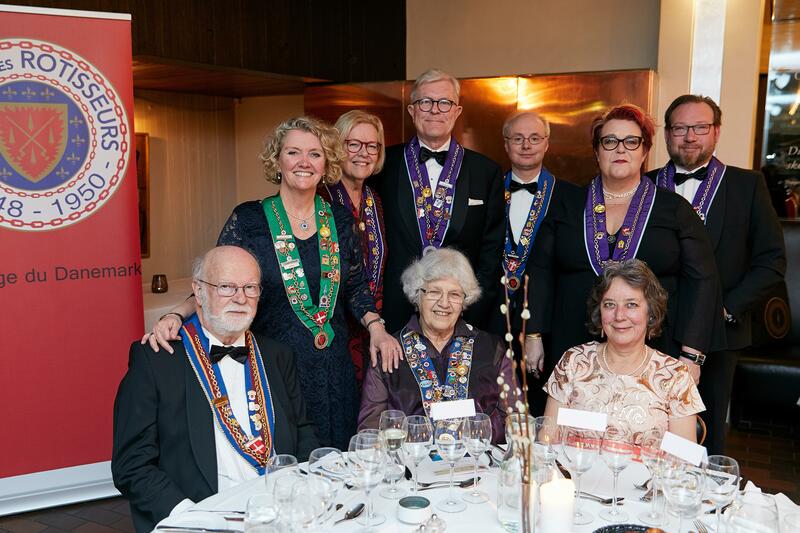 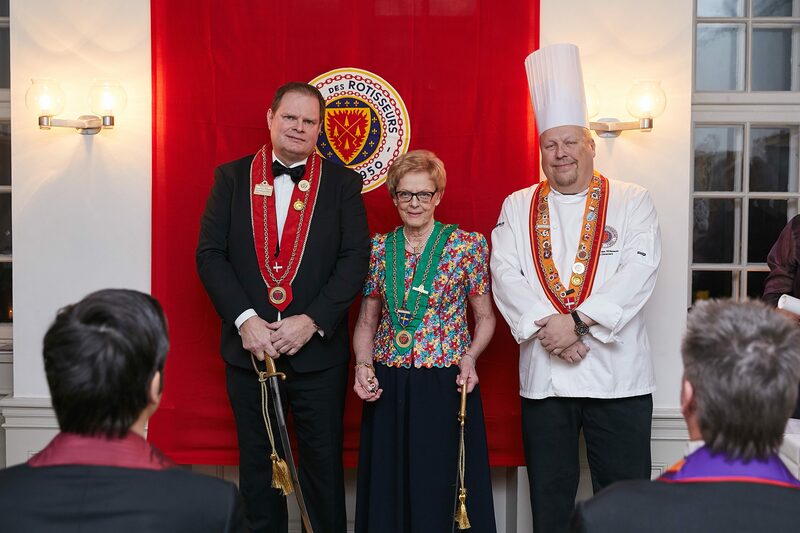 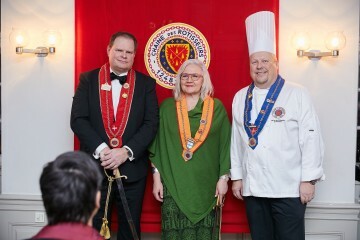 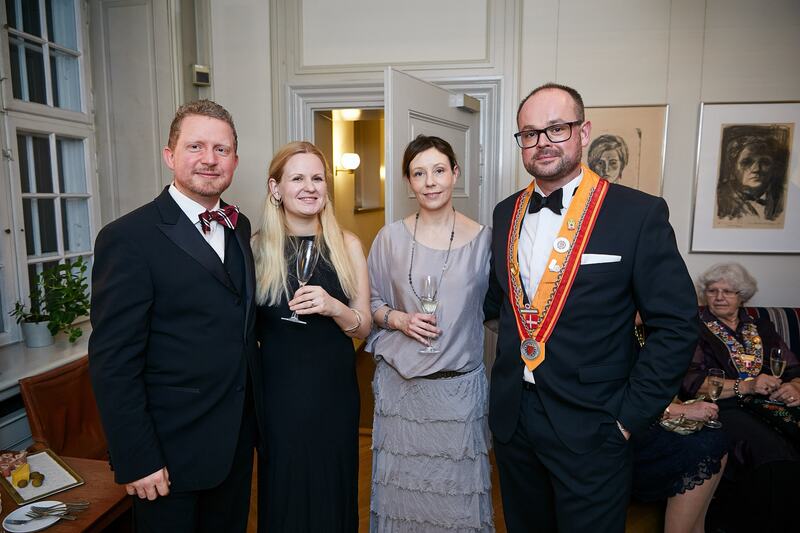 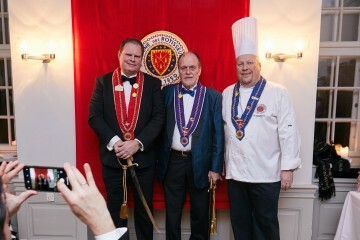 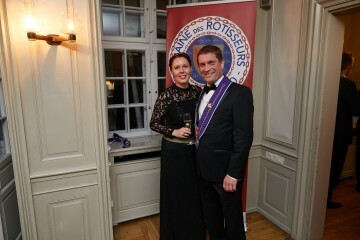 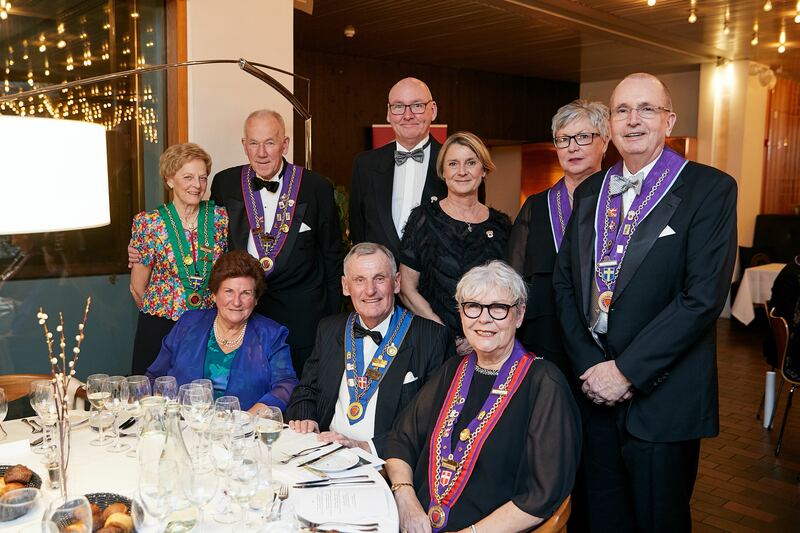 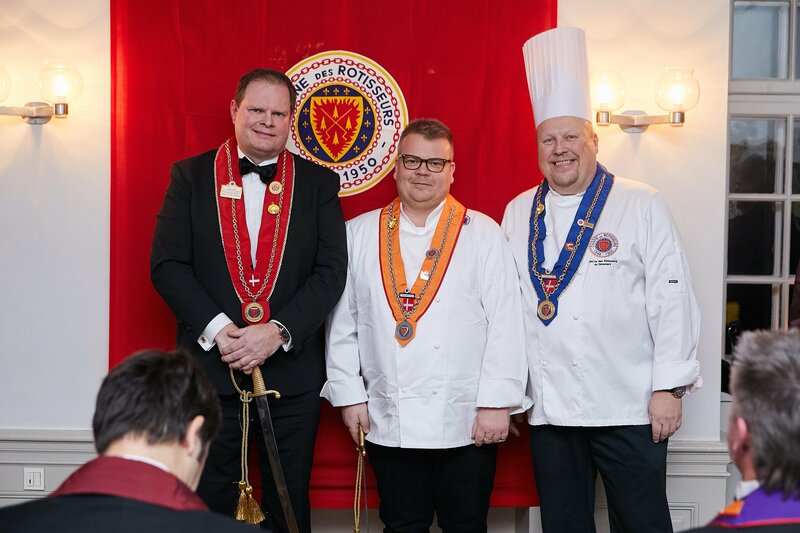 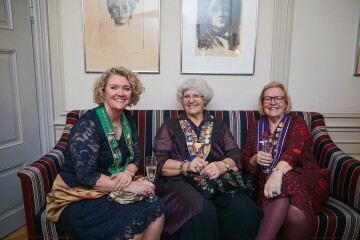 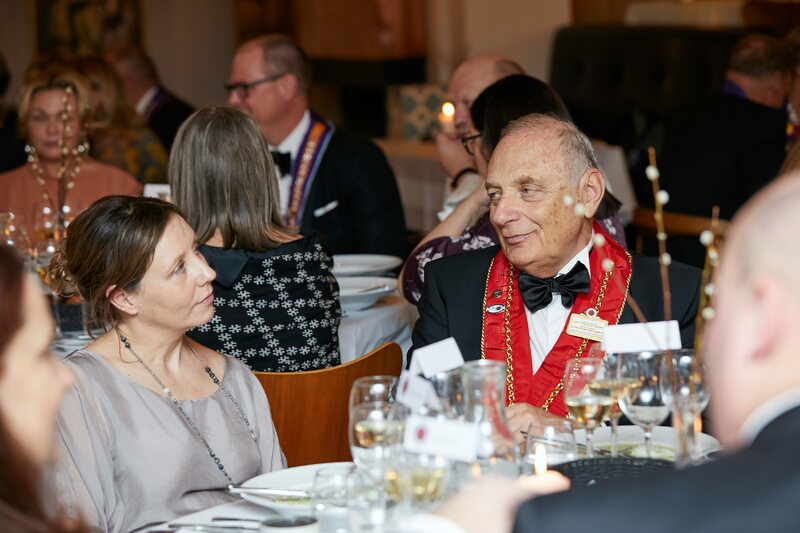 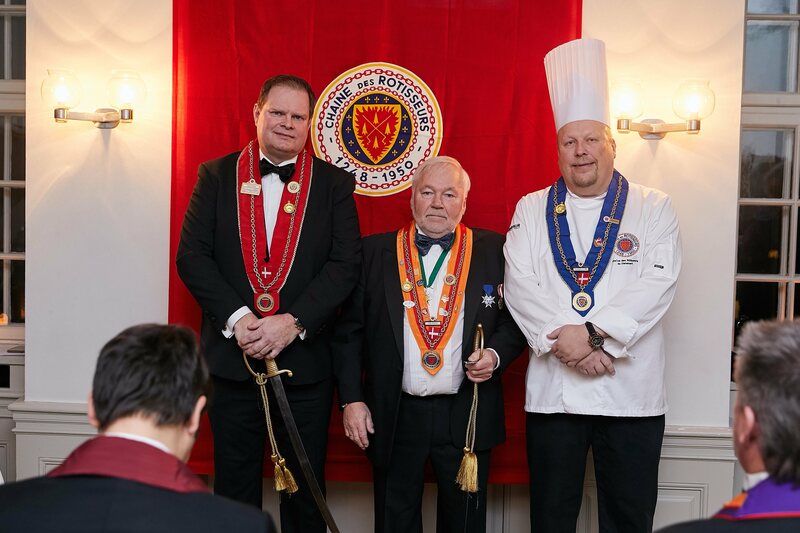 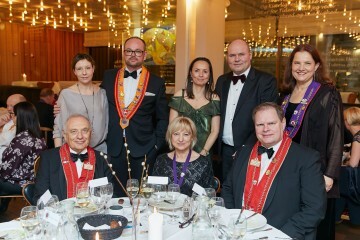 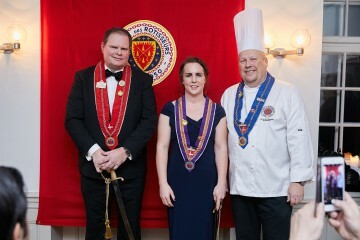 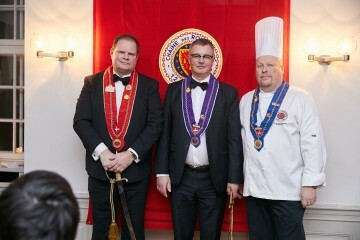 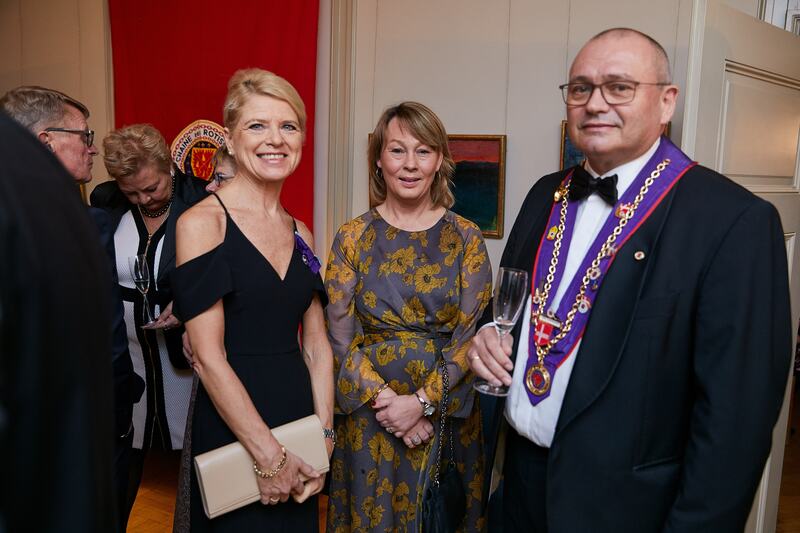 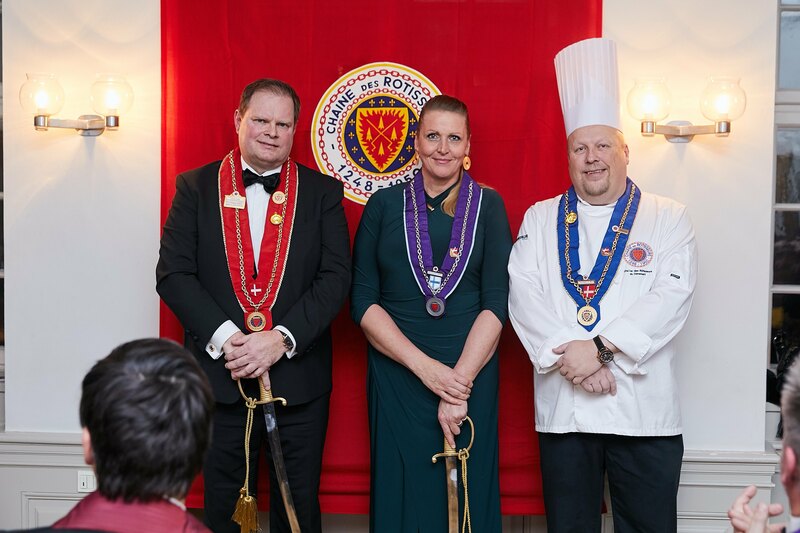 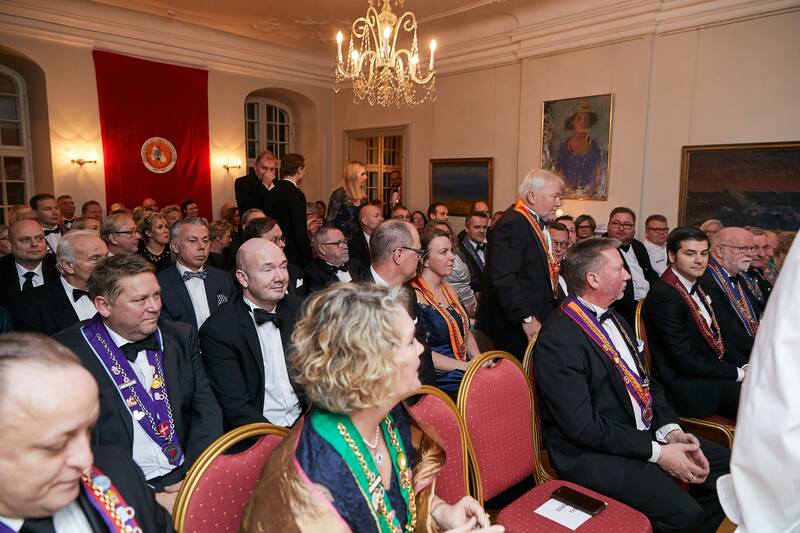 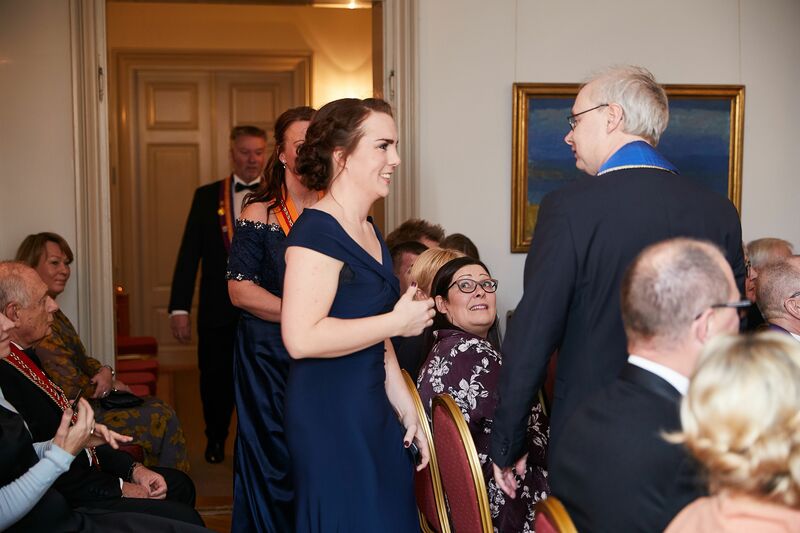 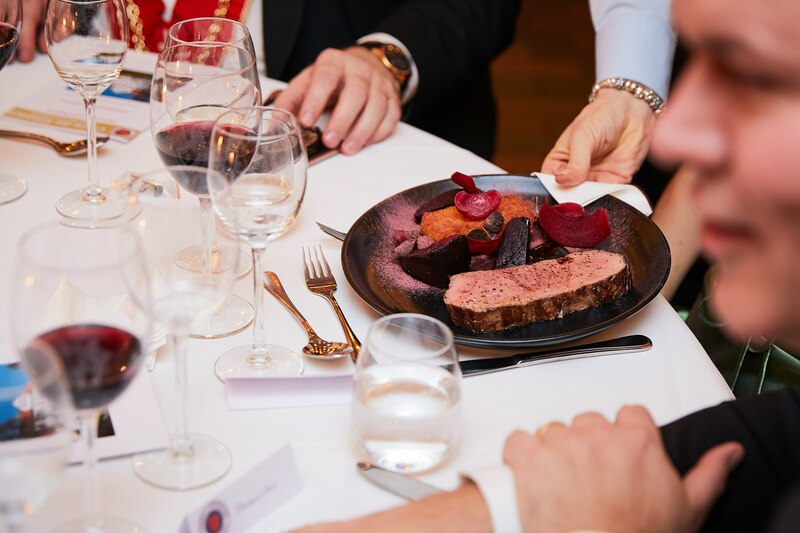 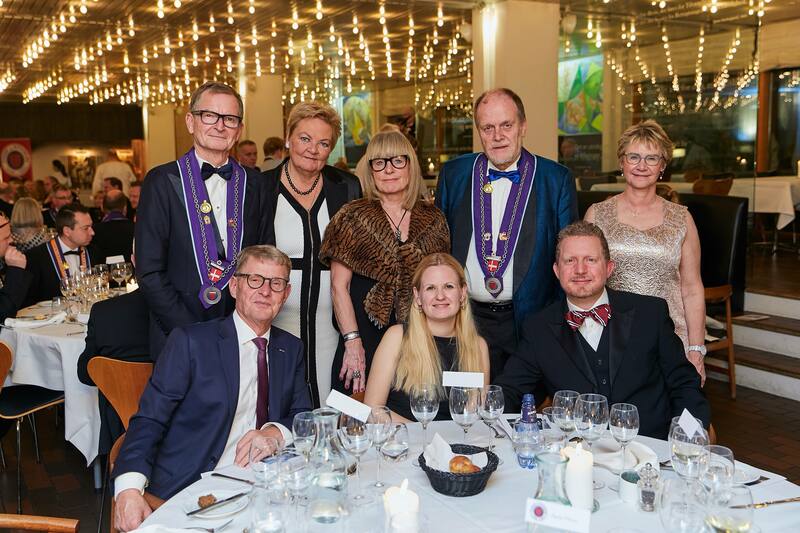 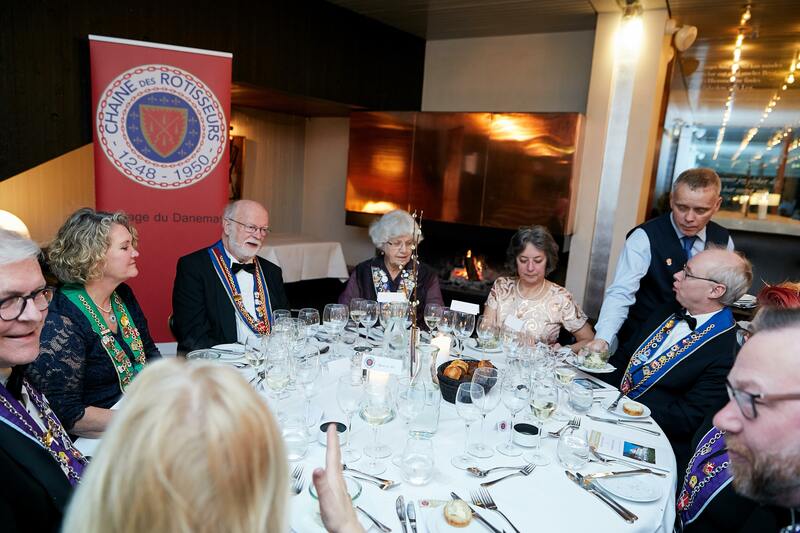 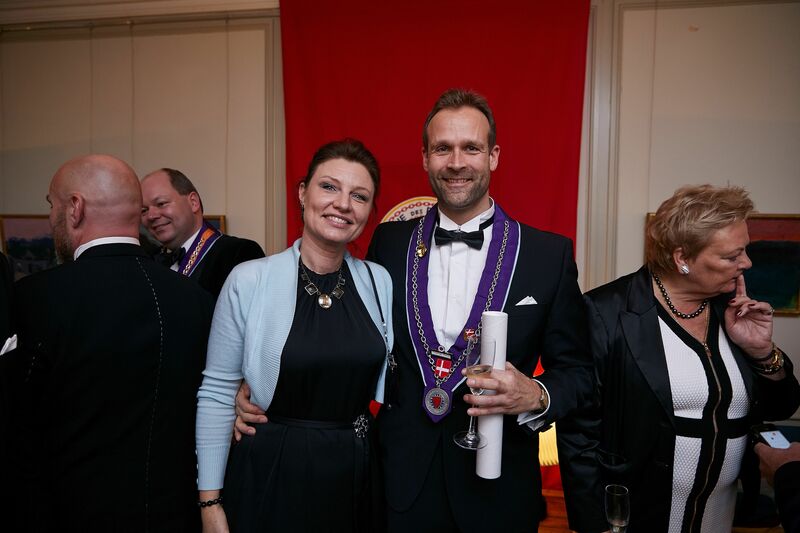 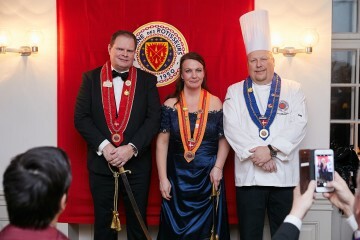 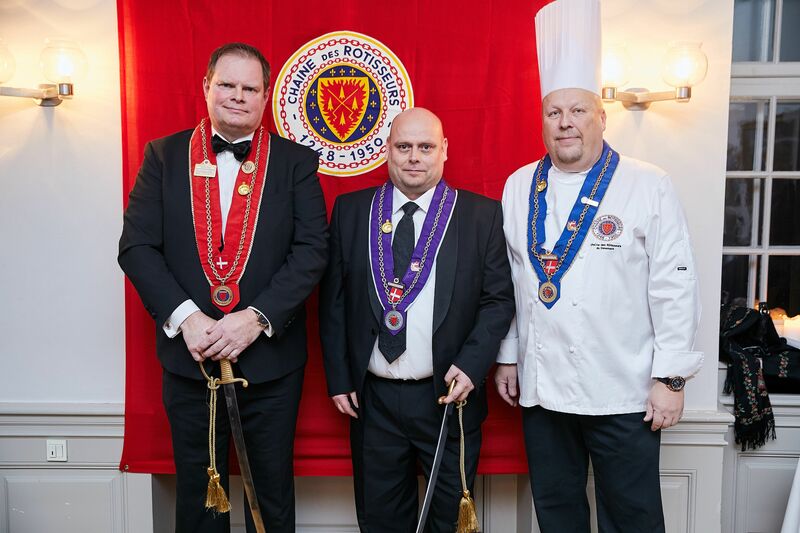 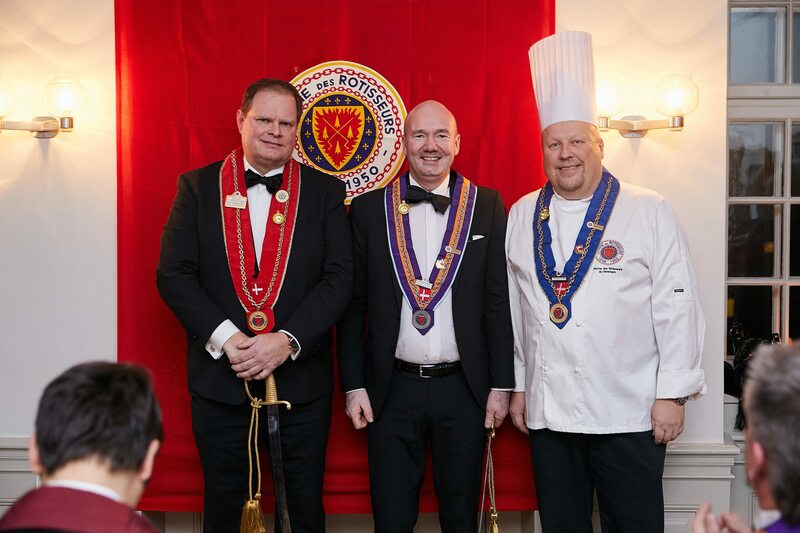 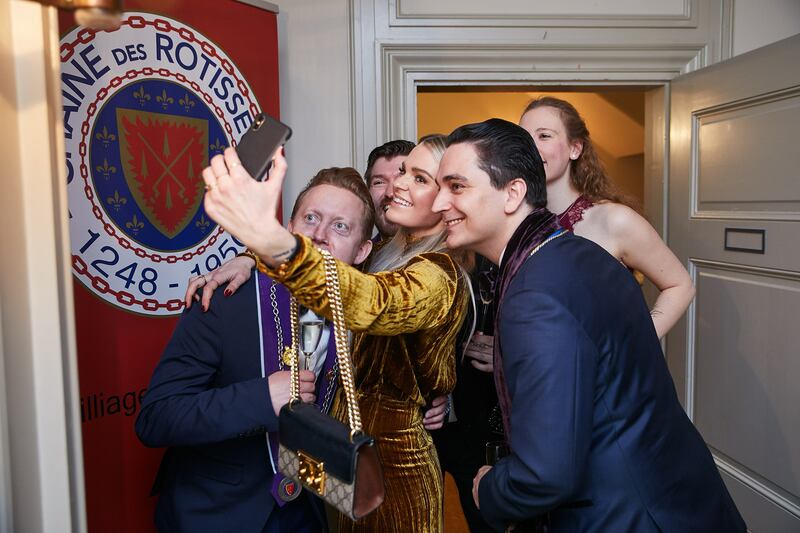 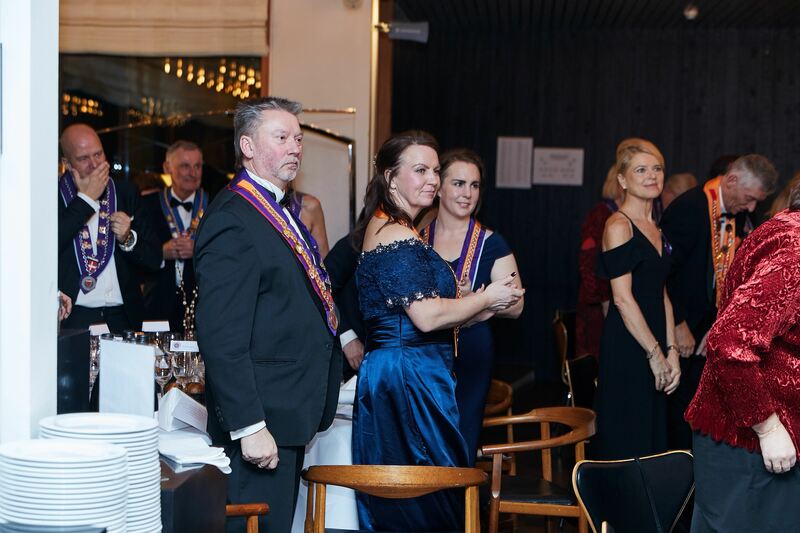 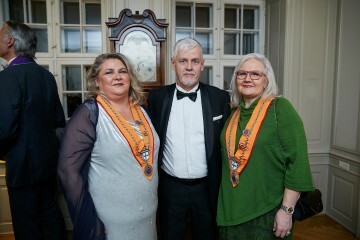 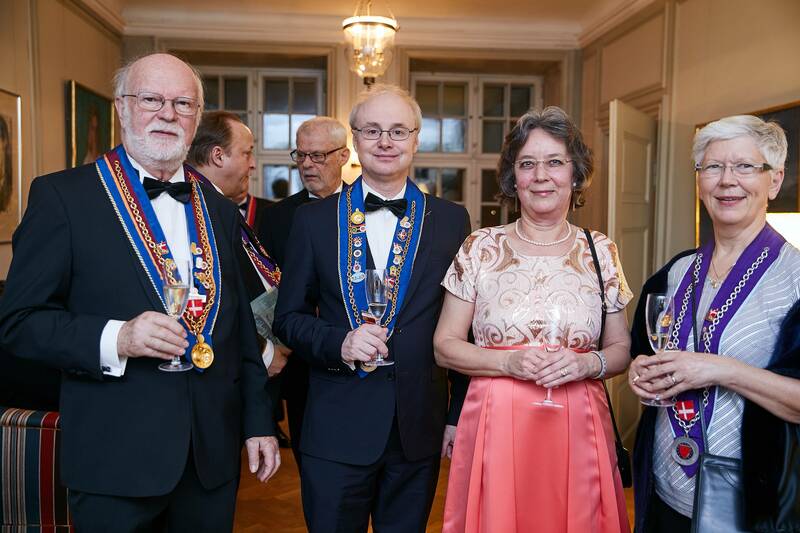 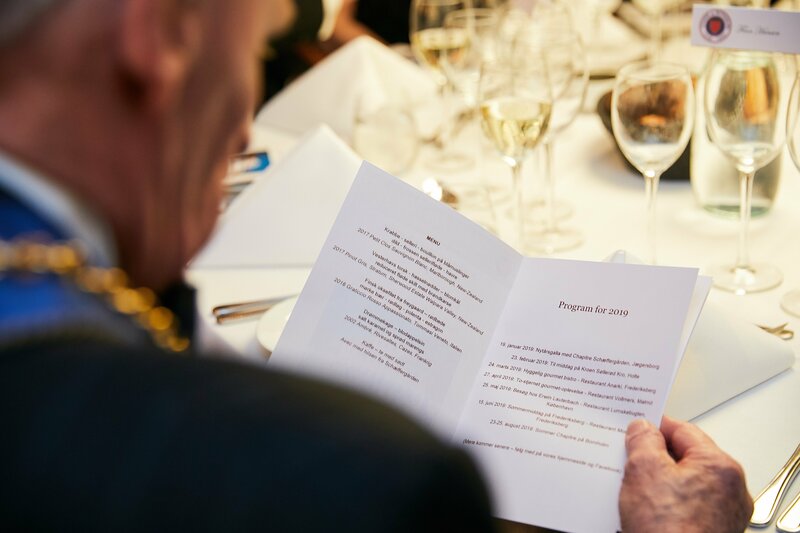 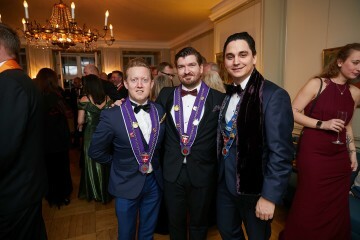 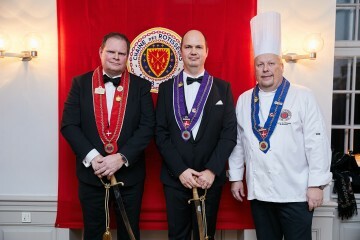 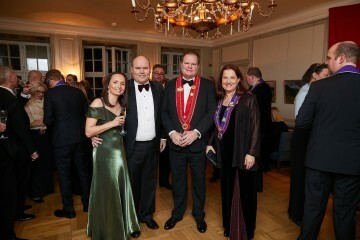 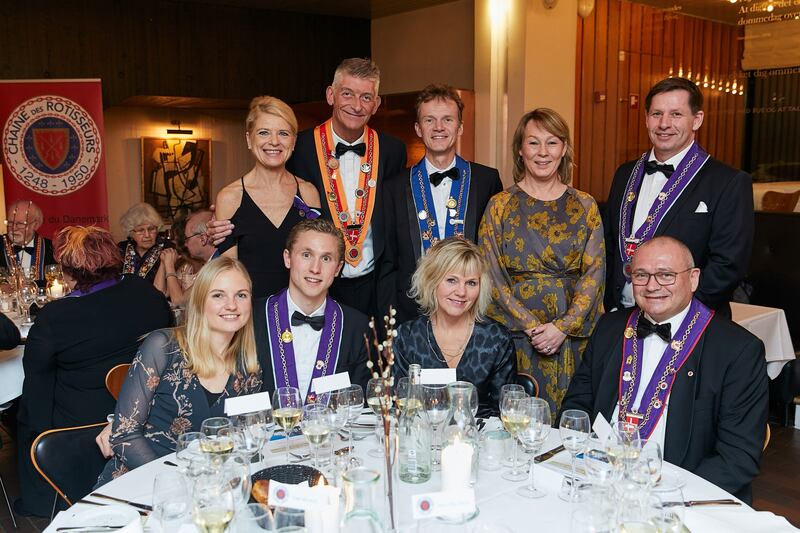 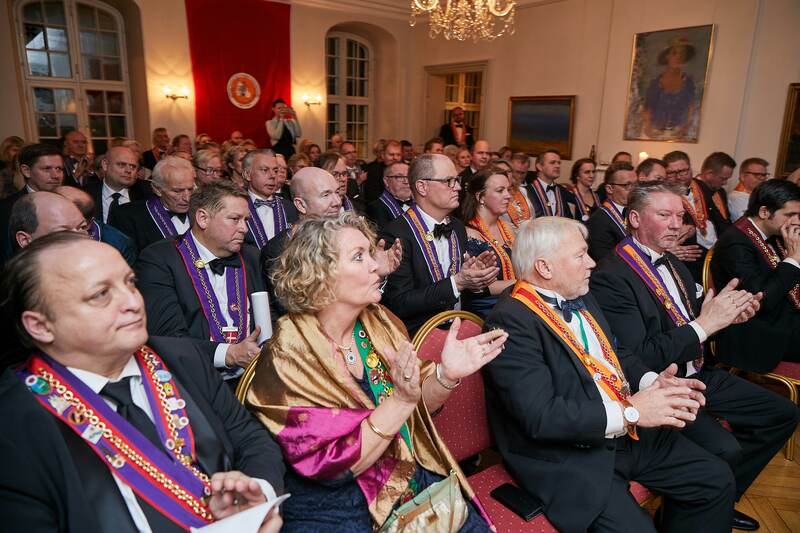 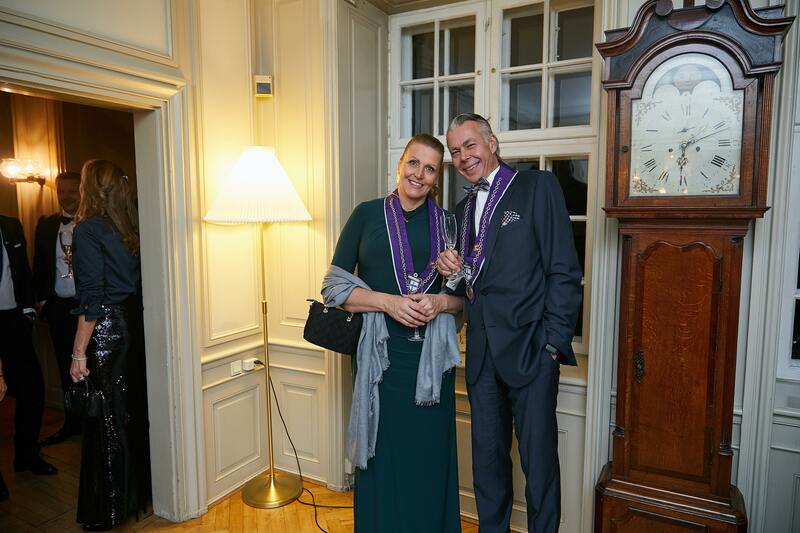 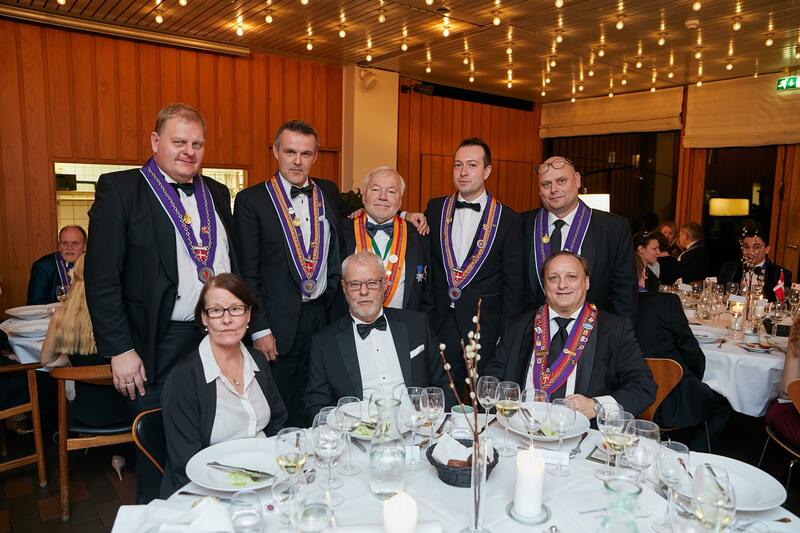 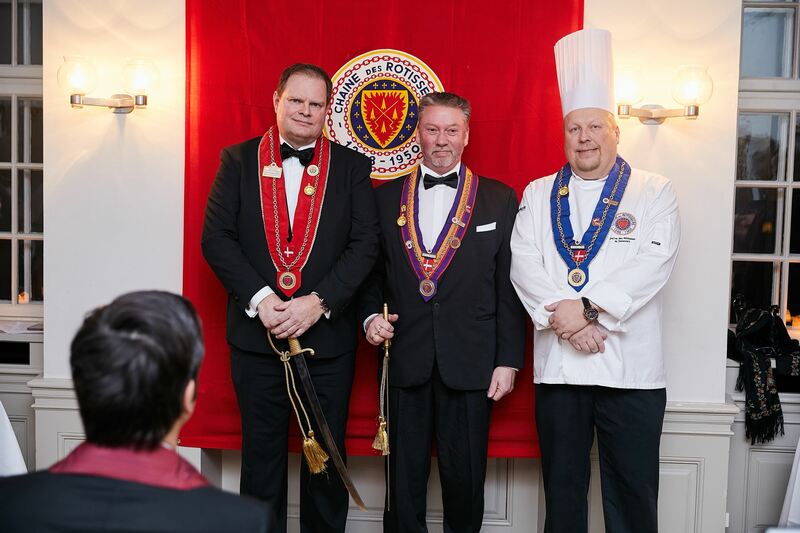 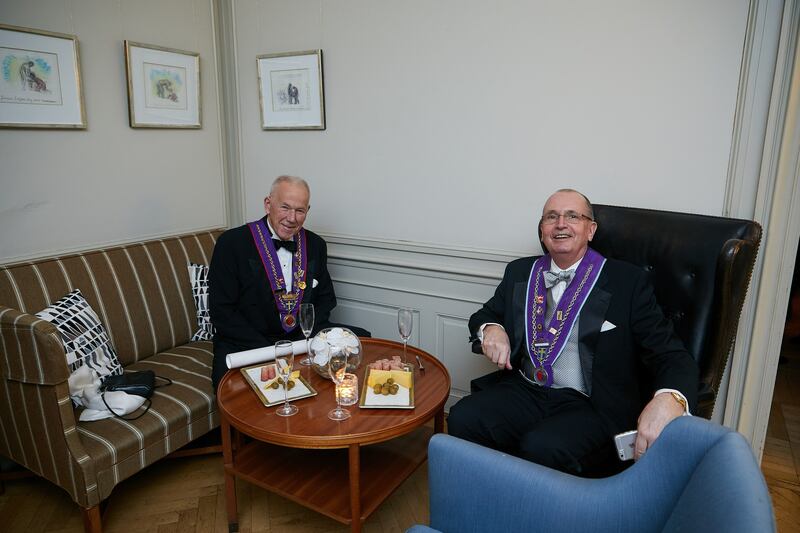 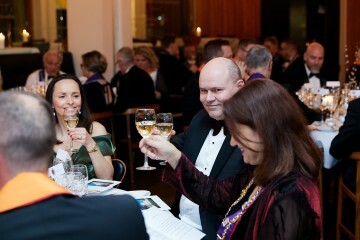 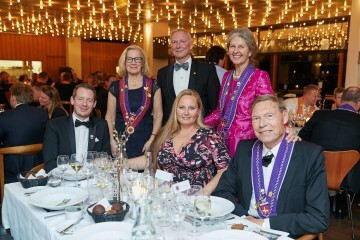 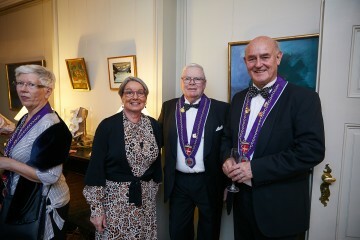 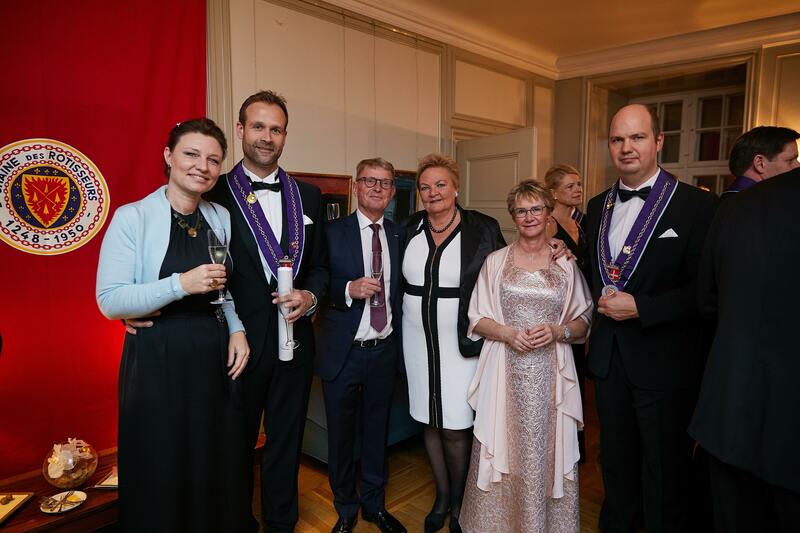 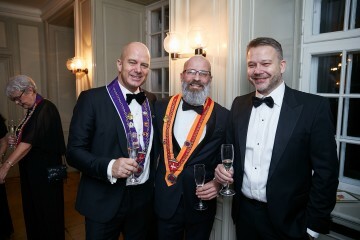 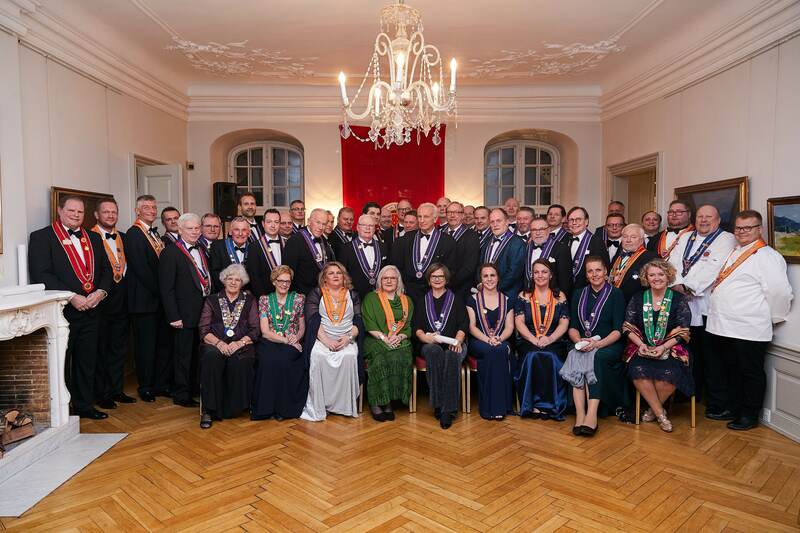 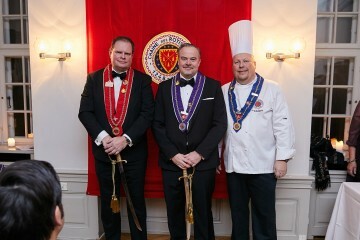 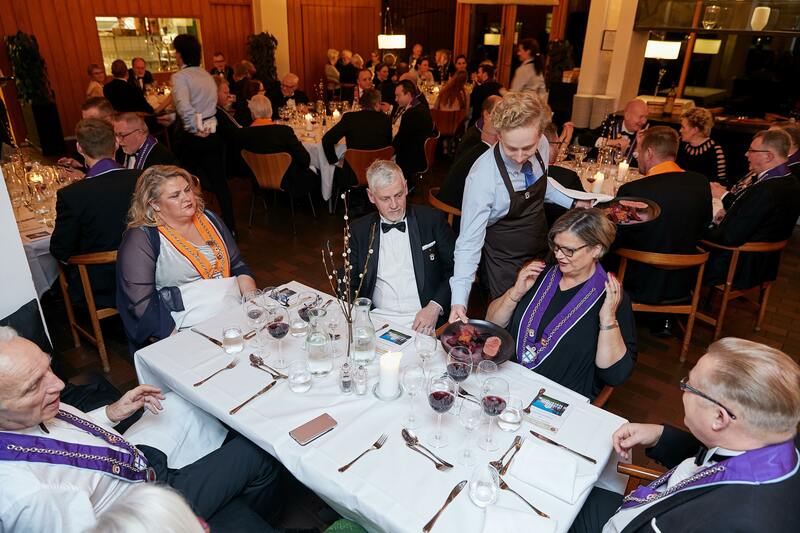 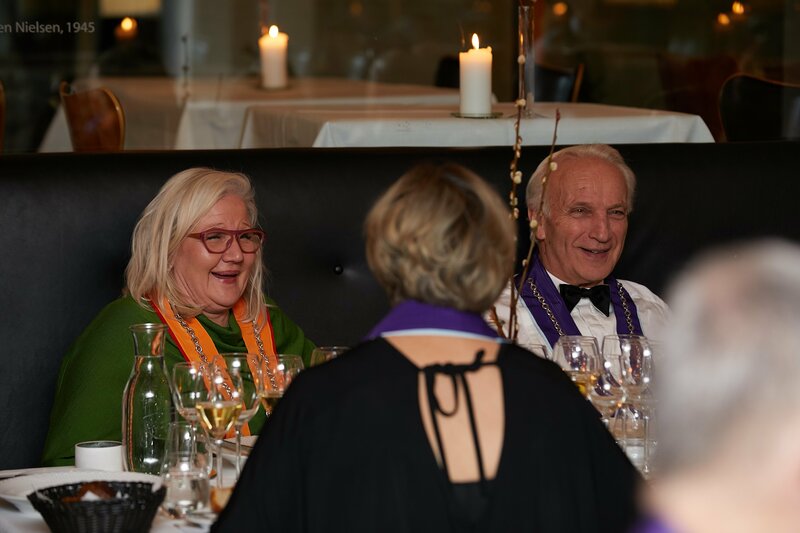 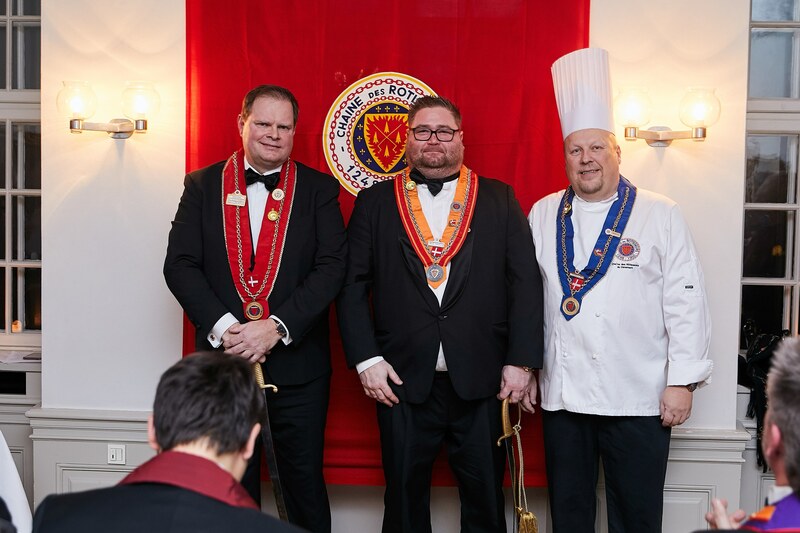 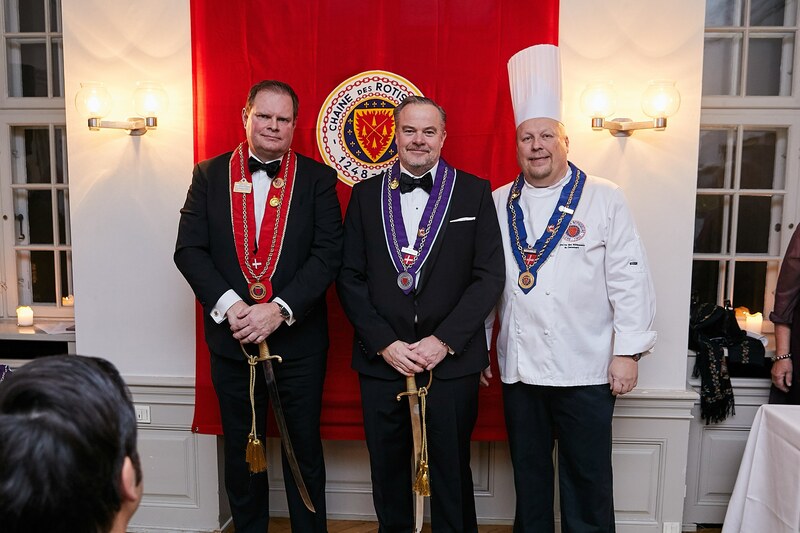 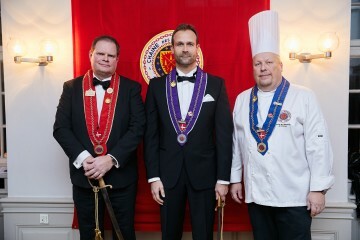 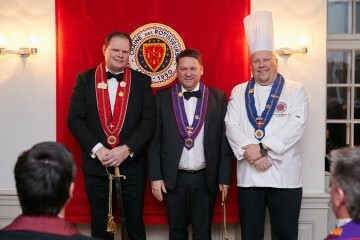 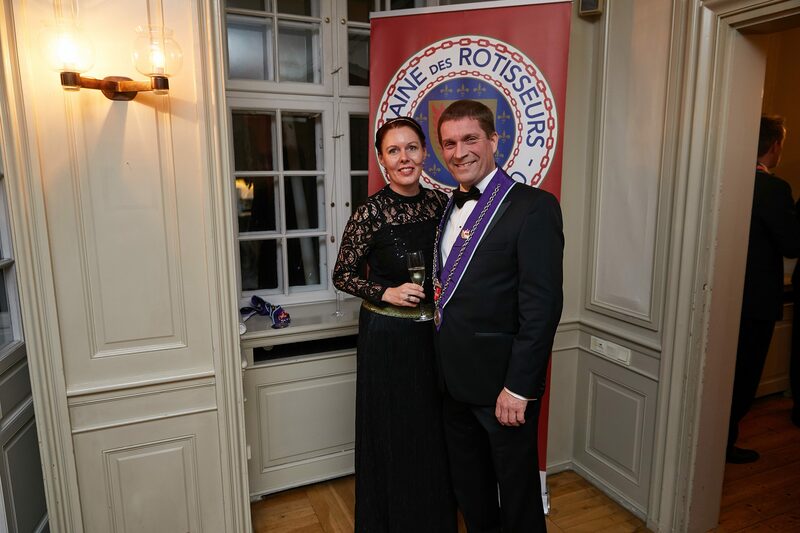 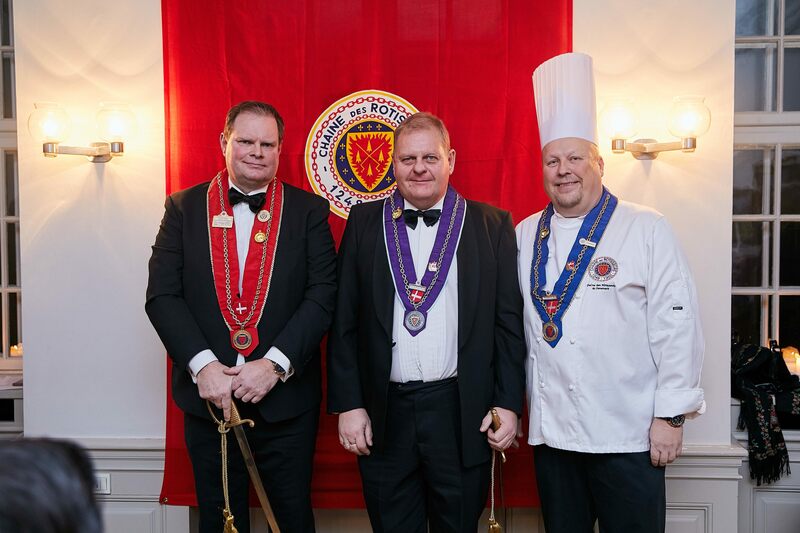 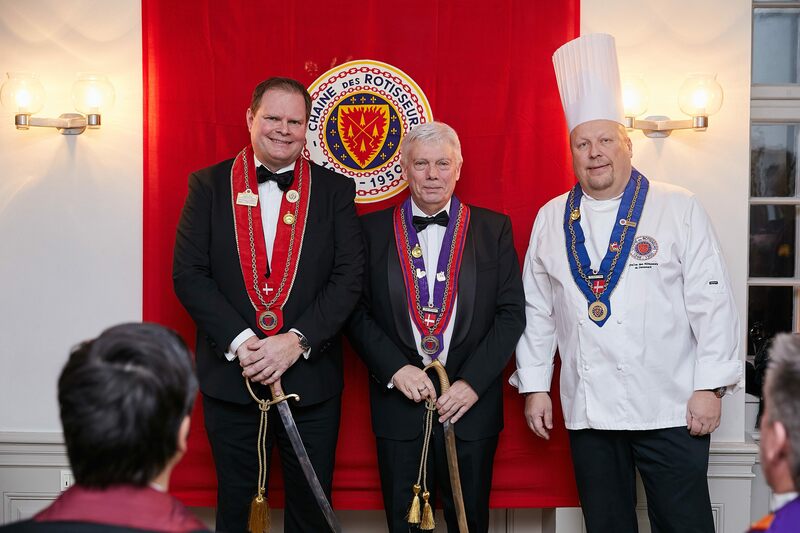 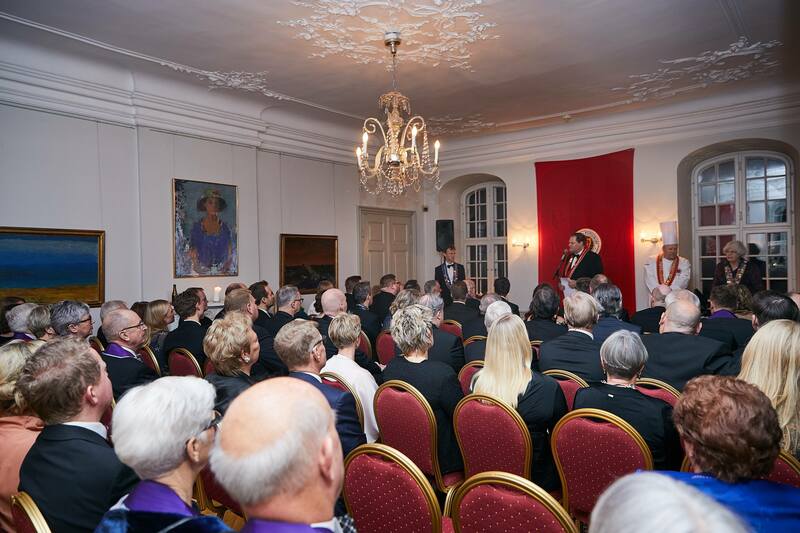 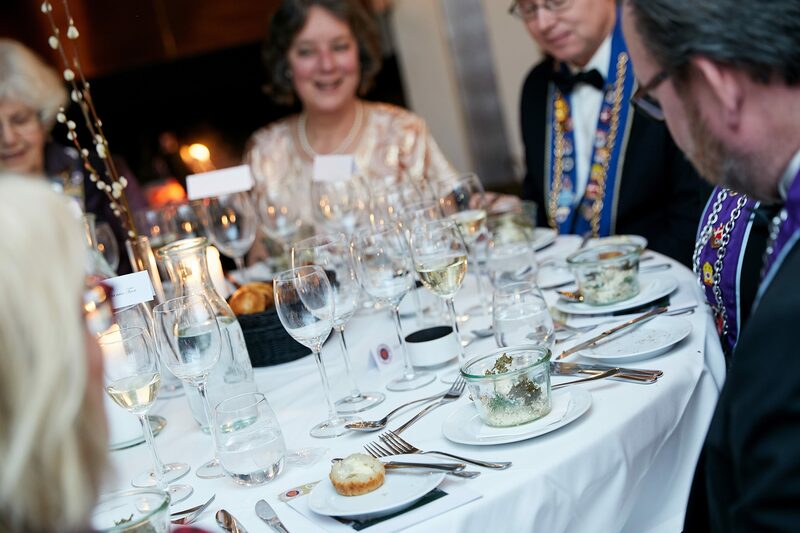 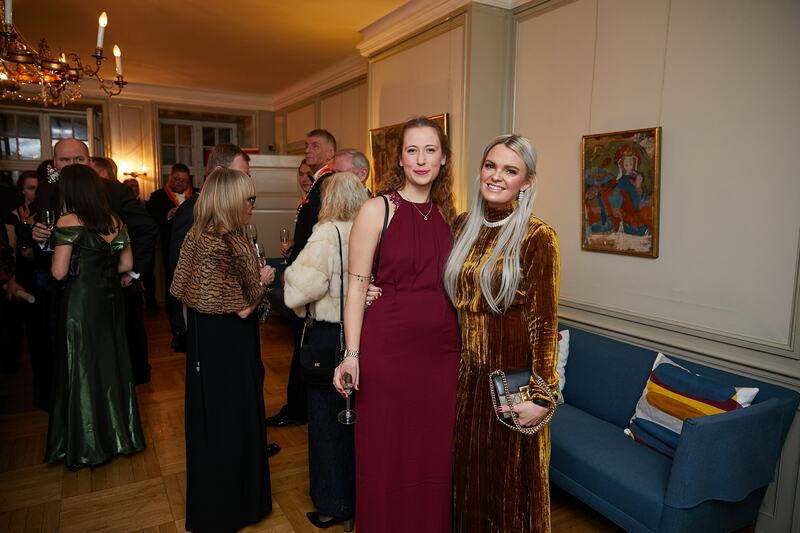 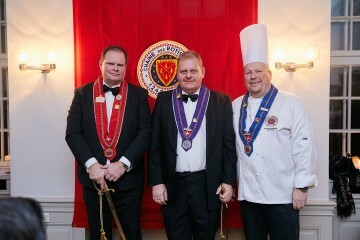 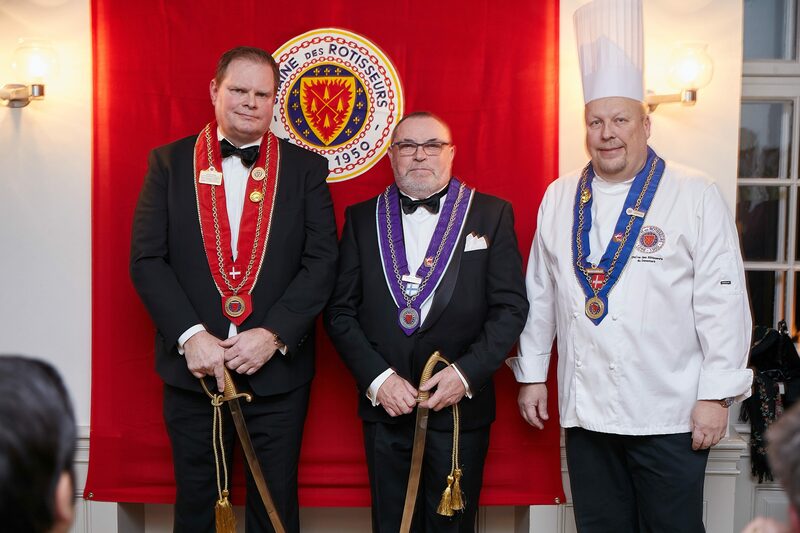 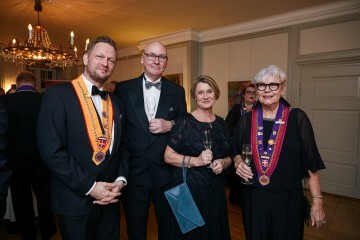 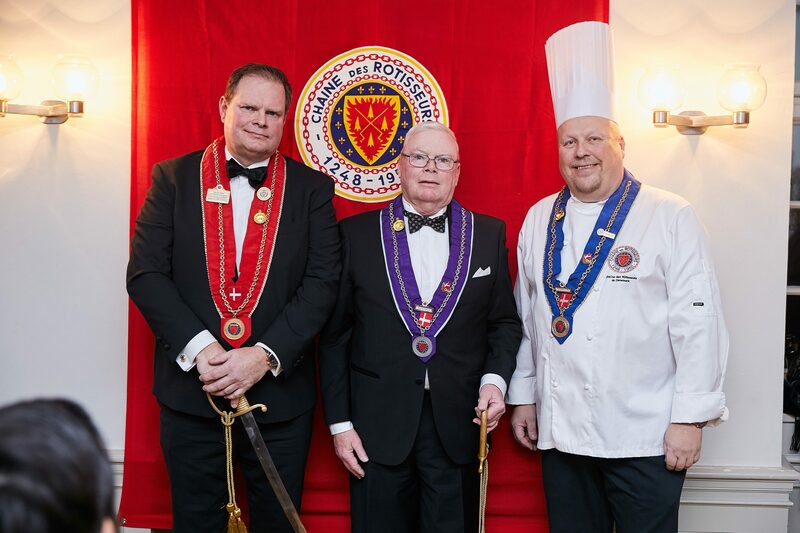 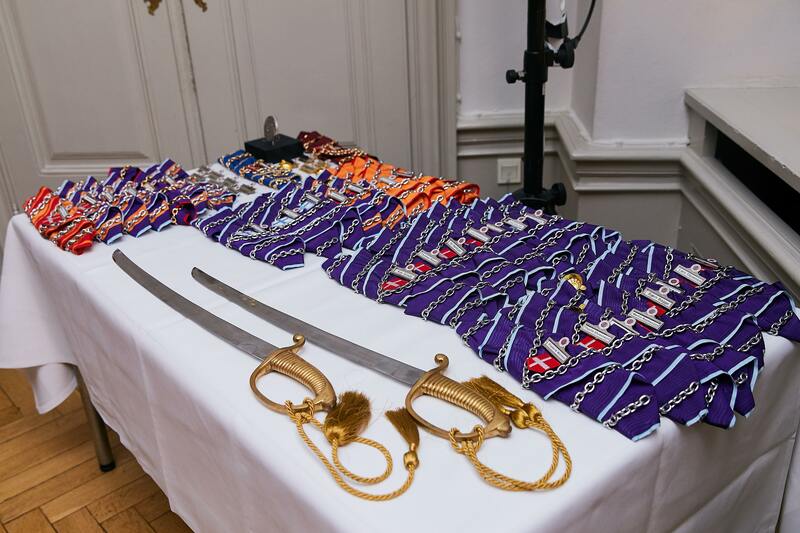 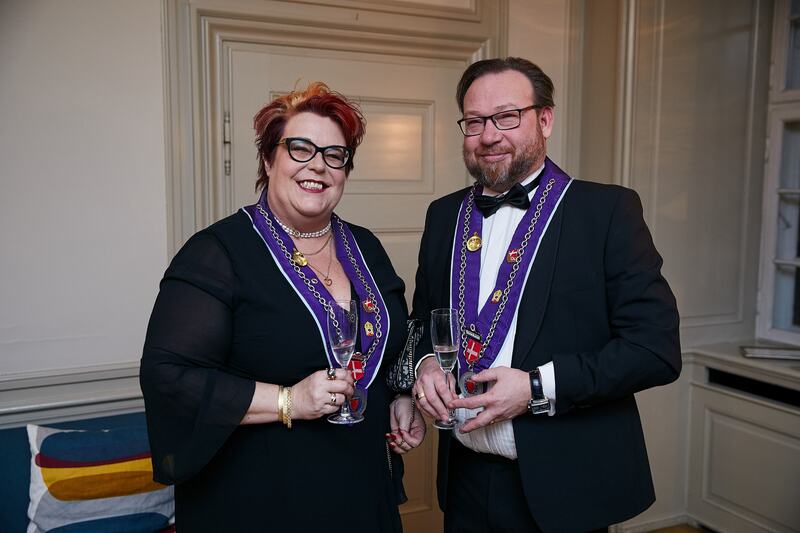 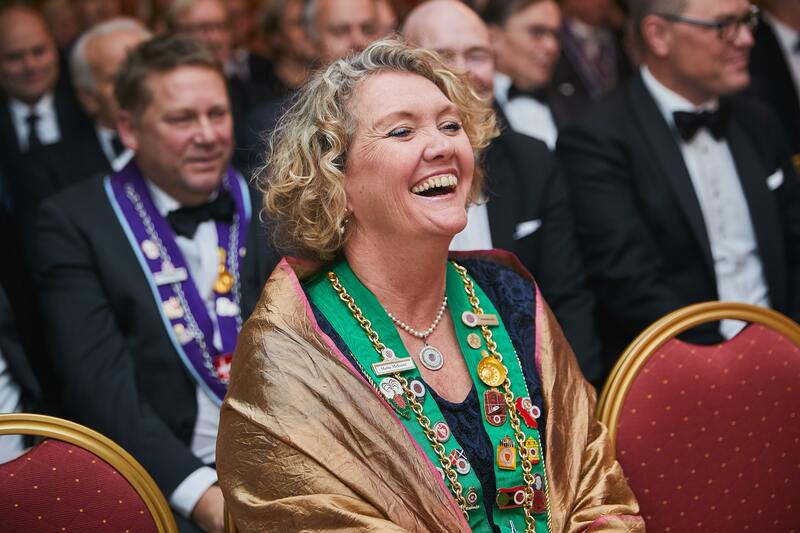 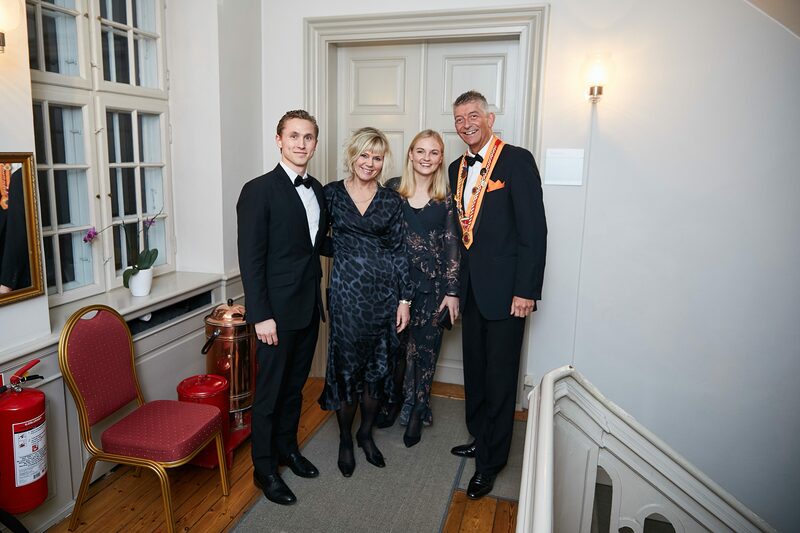 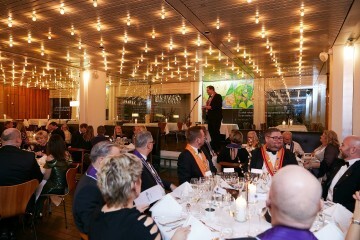 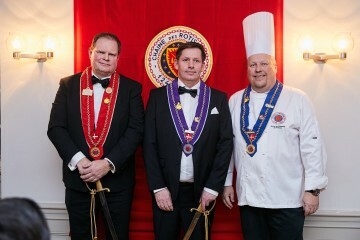 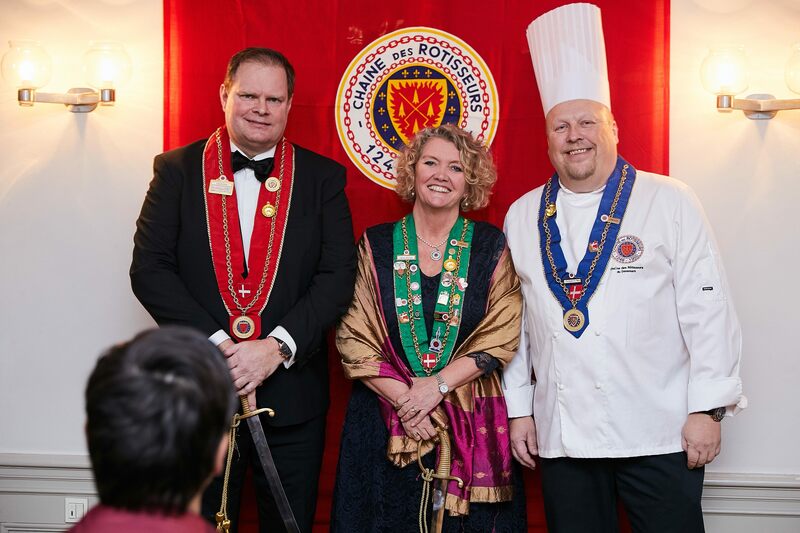 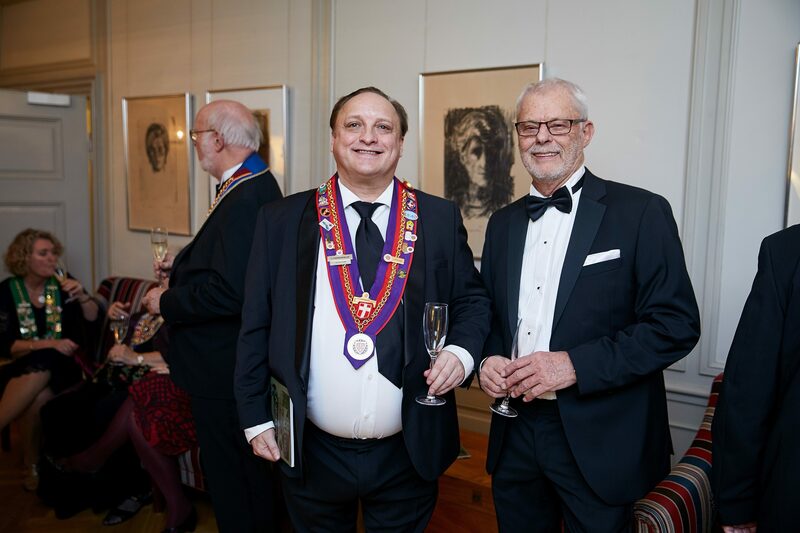 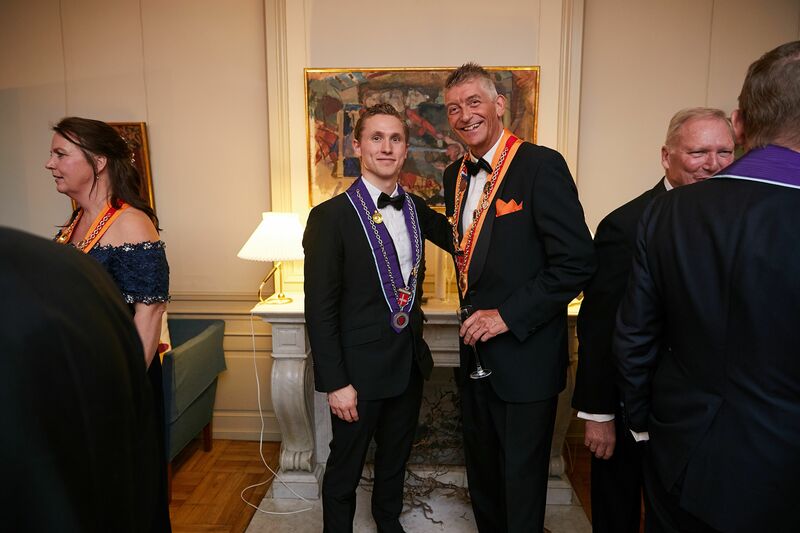 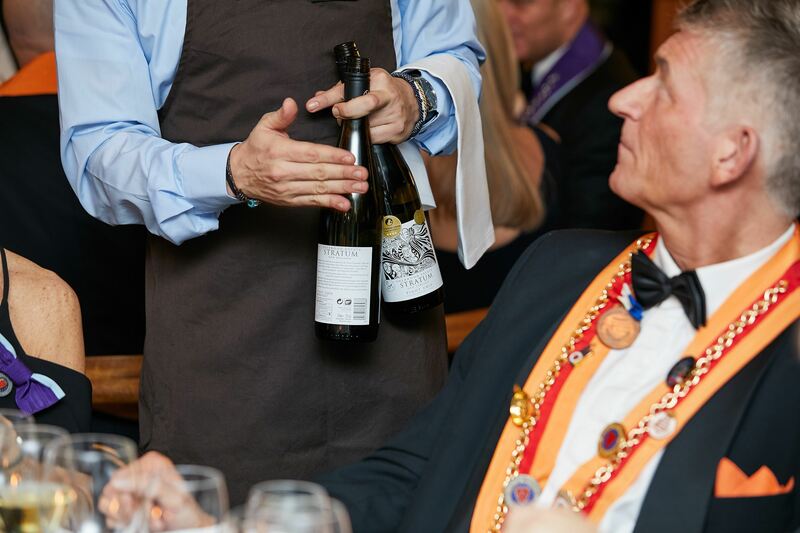 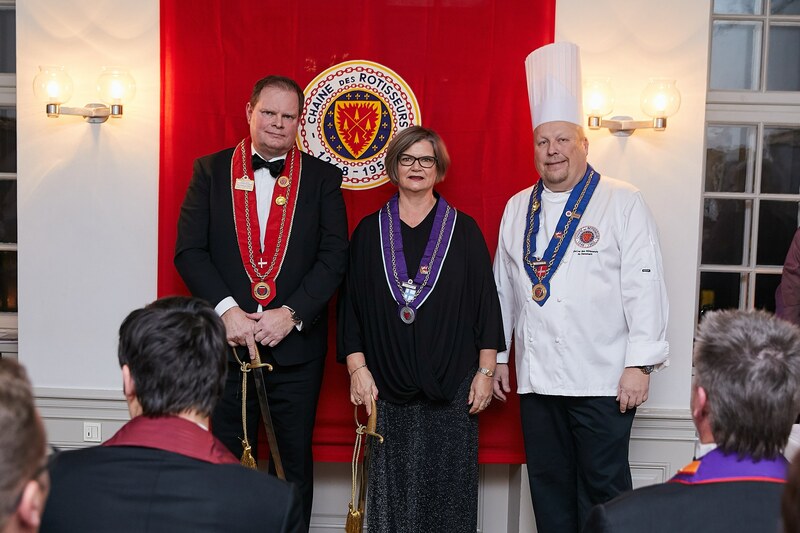 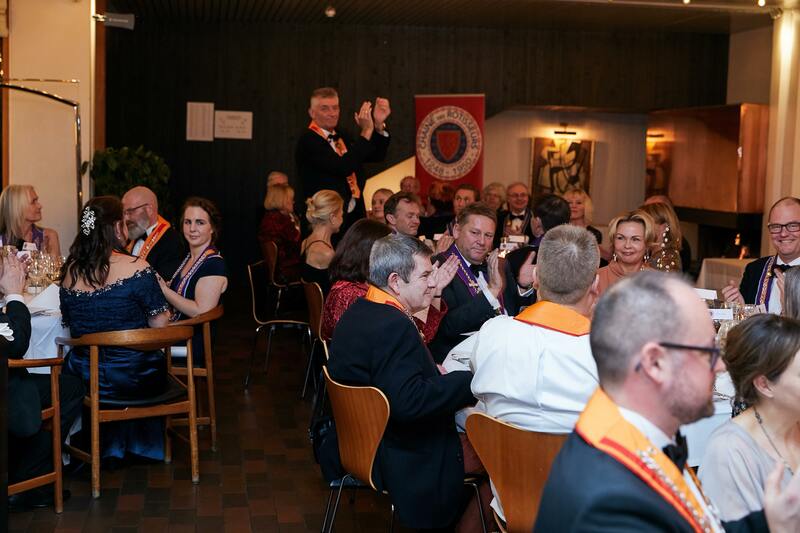 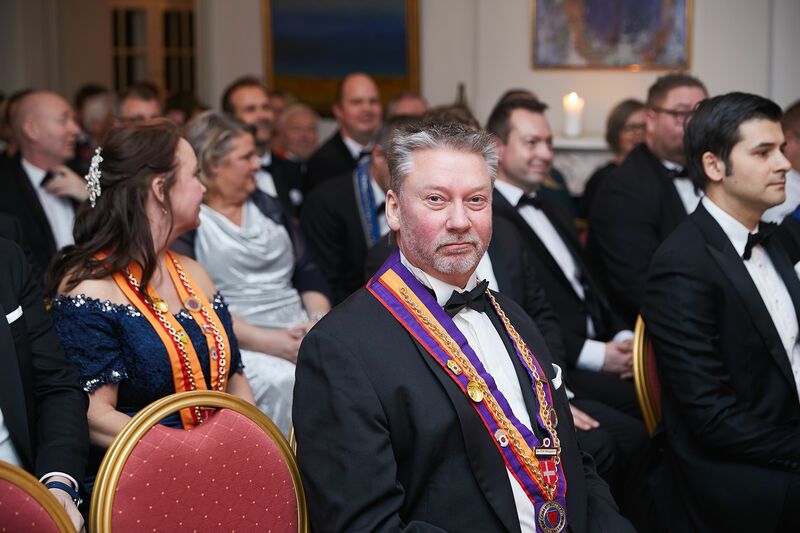 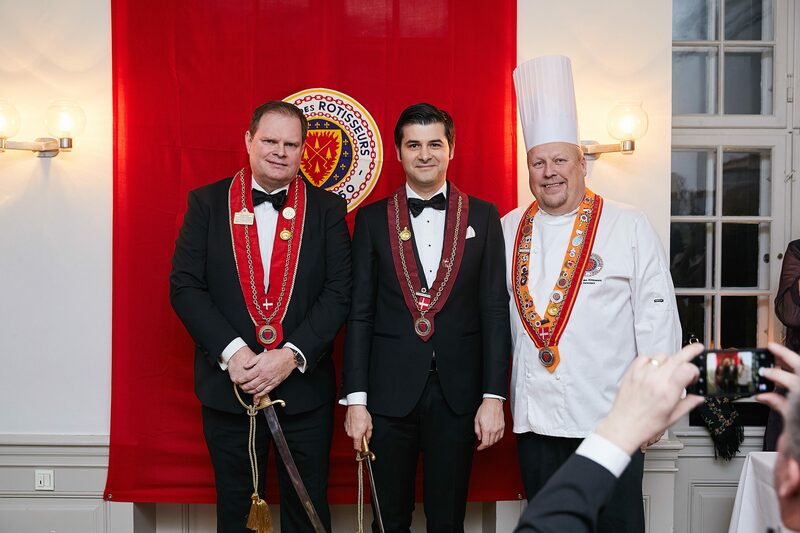 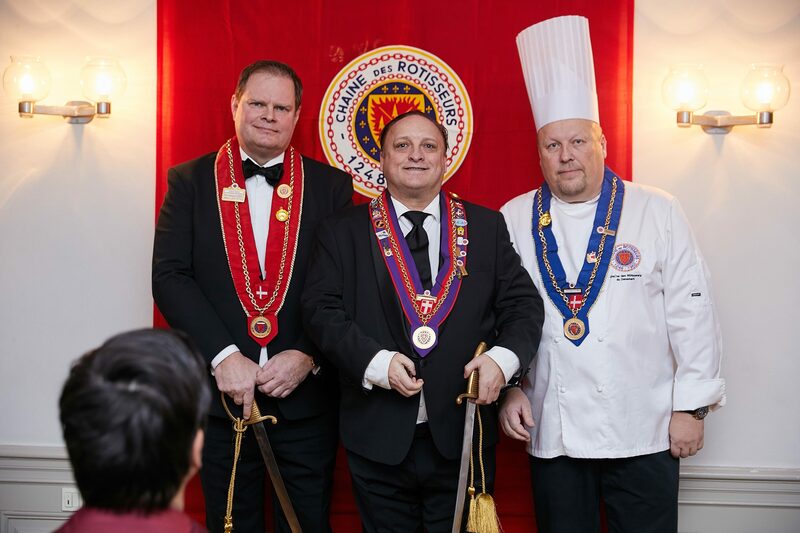 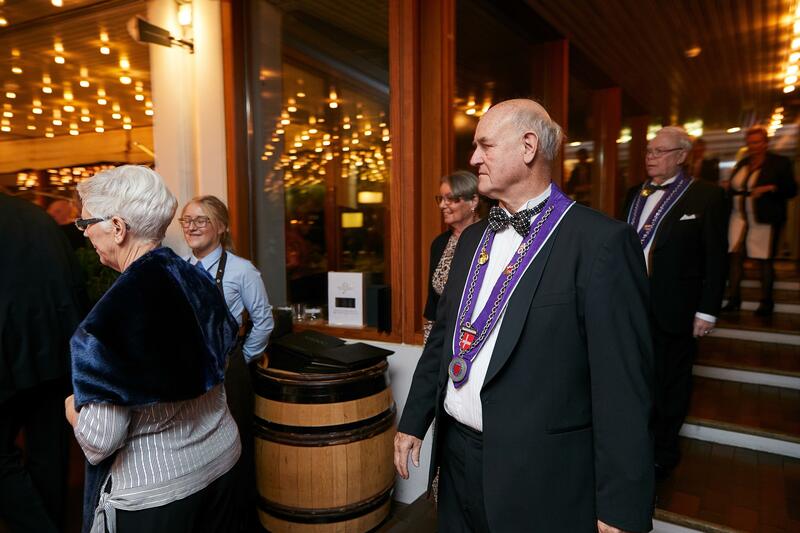 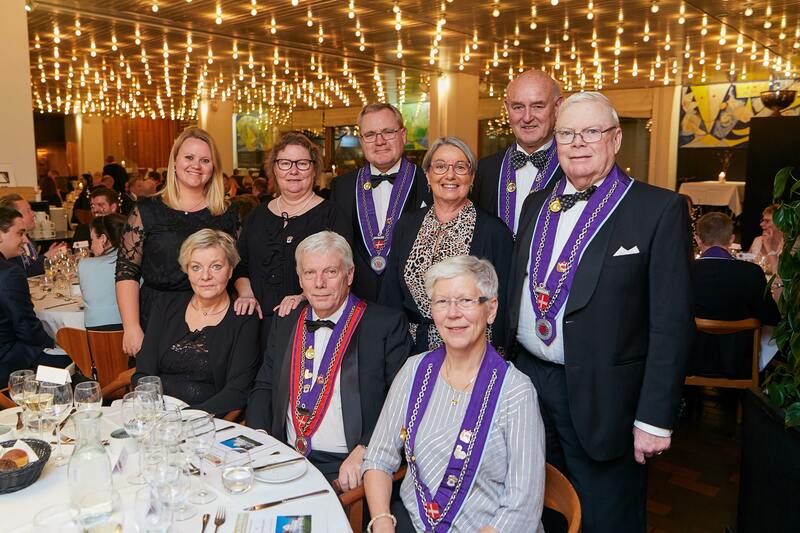 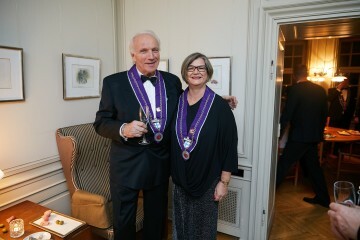 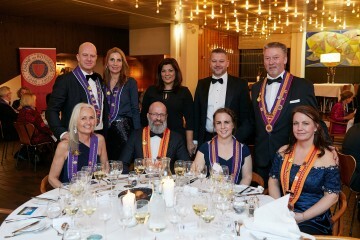 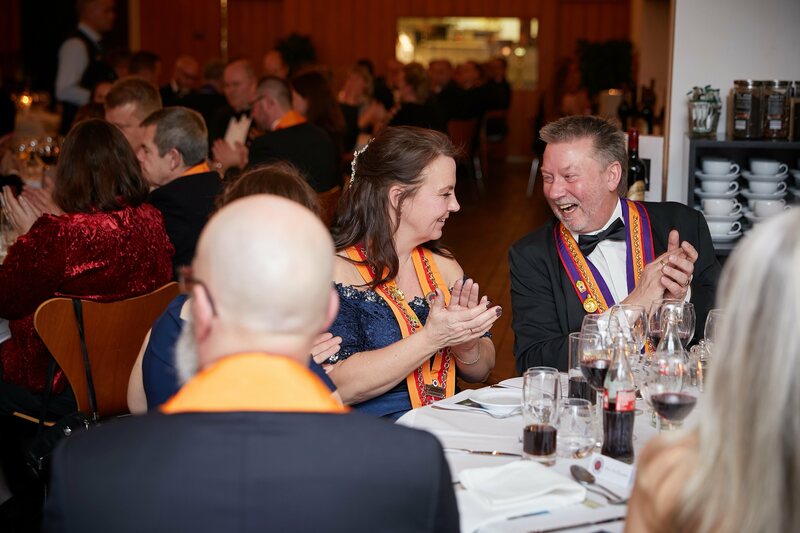 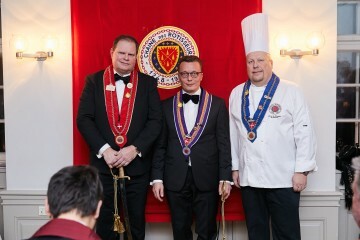 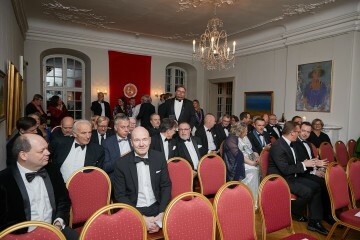 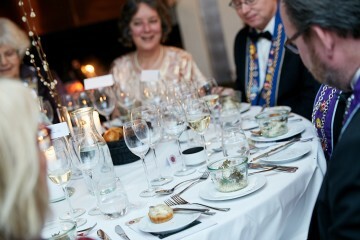 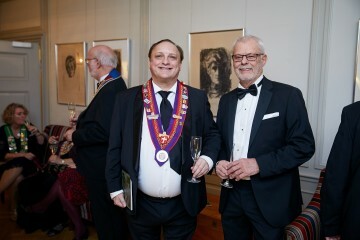 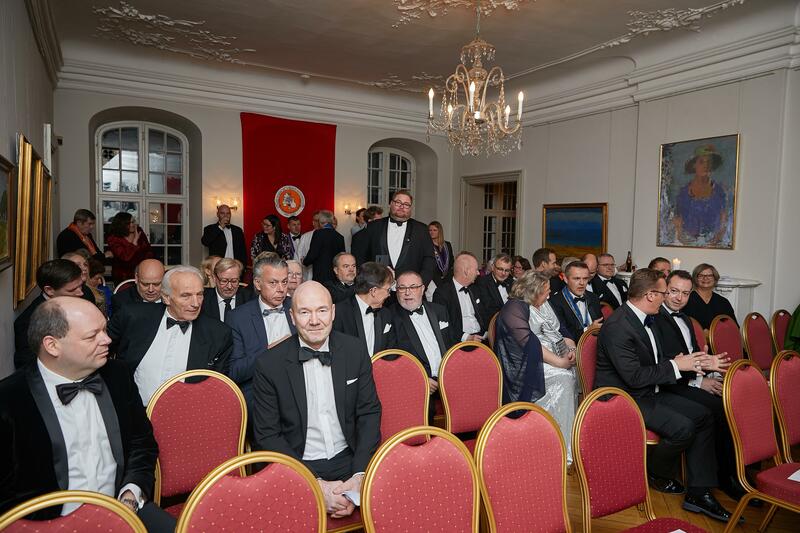 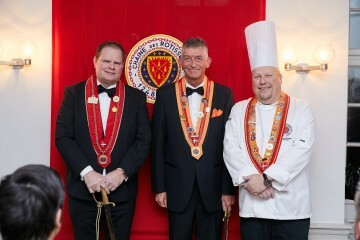 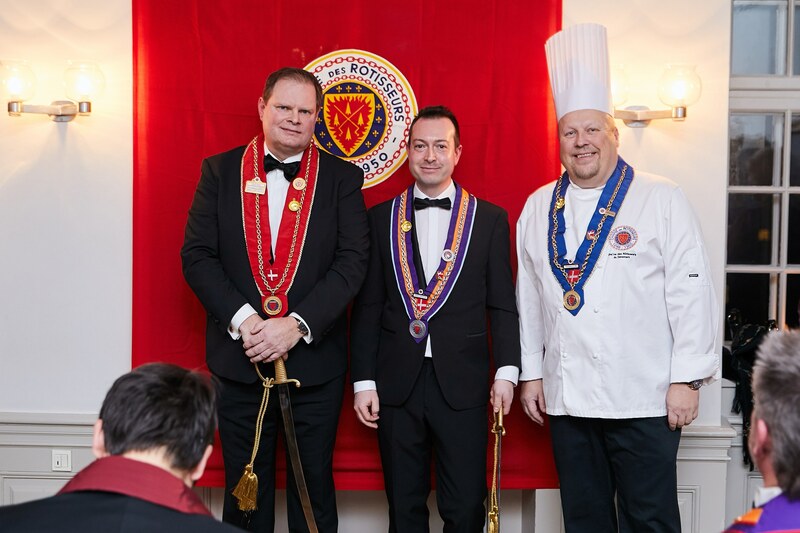 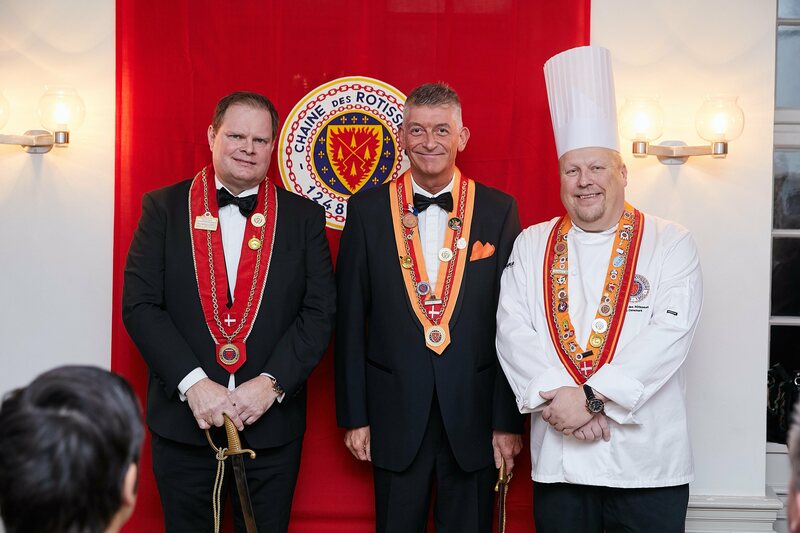 The first arrangement in 2019 for Chaîne des Rôtisseurs de Danemark was the traditional New Year's Chapitre and Grand Diner. 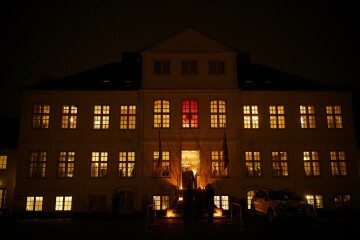 It took place at Schæffergården, a castle in rococo style by the famous architect Dietrich Schäffer in 1755. 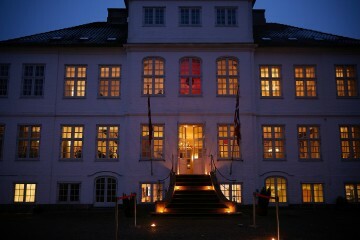 It was used by King Christian 10th and brother Prince Harald as a hunting castle. 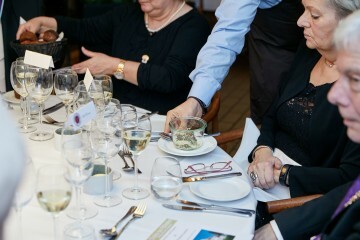 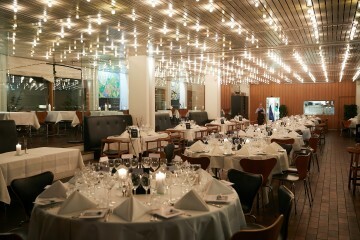 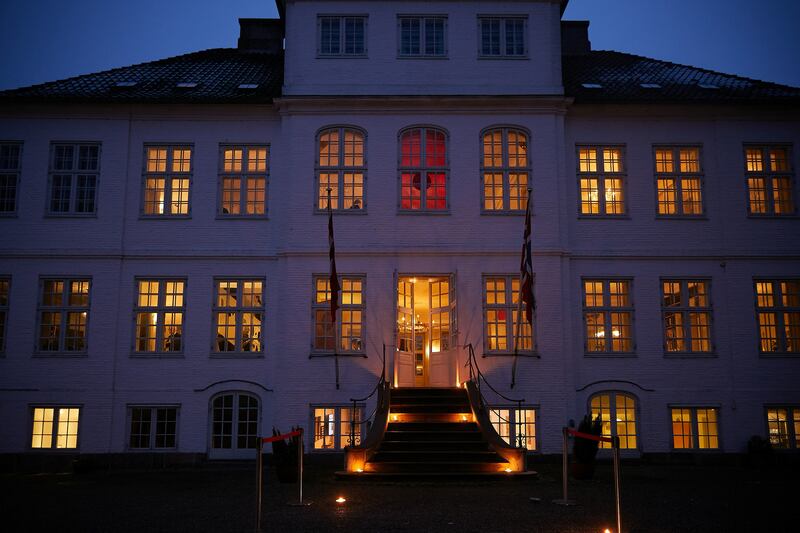 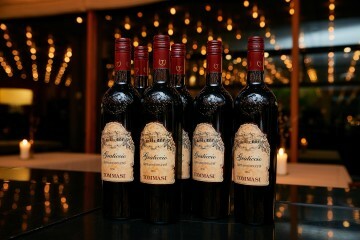 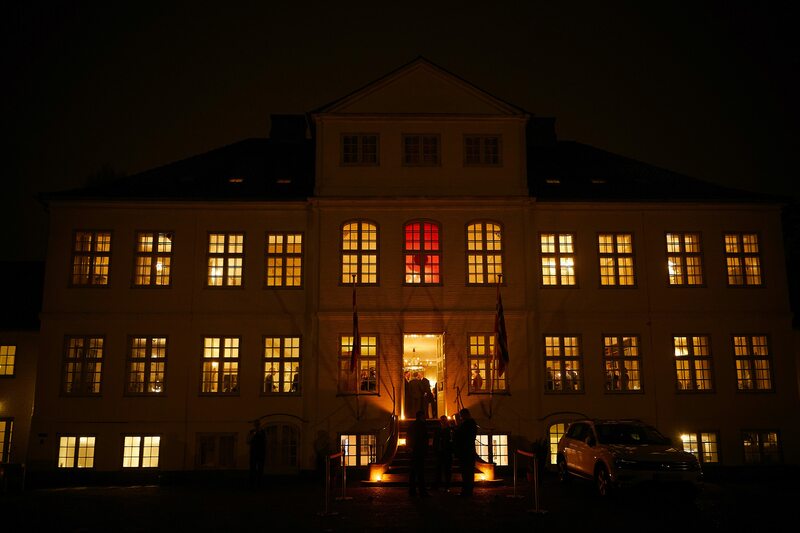 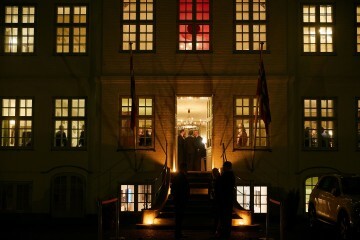 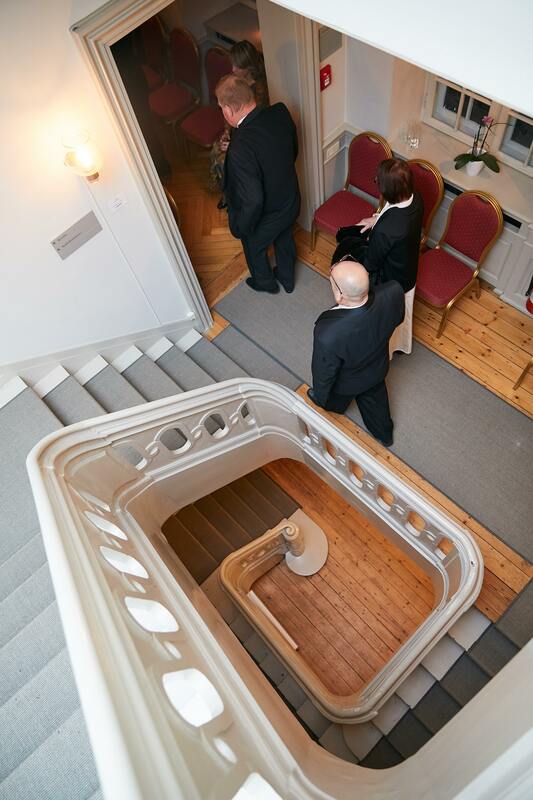 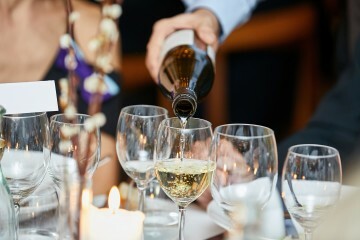 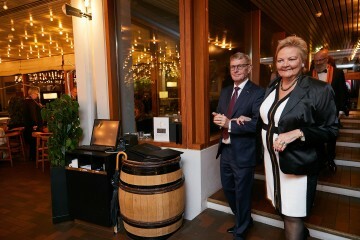 Today it is owned by the Foundation for Danish-Norwegian Cooperation and functions as a hotel with gourmet restaurant. 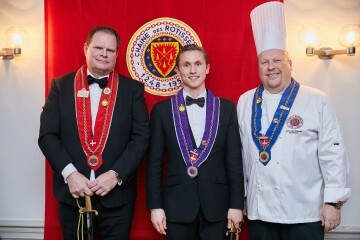 Director is our own Maître Rôtisseur Peter Gerløv Feddersen. Peter has a very solid gastronomic background as a Chef at Hotel Hesselet, at Crown prince Frederik's court and at restaurants Restaurationen and Divan 2. 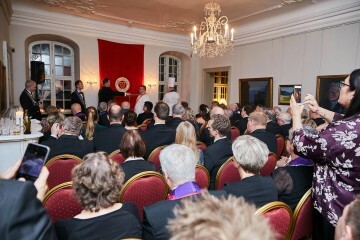 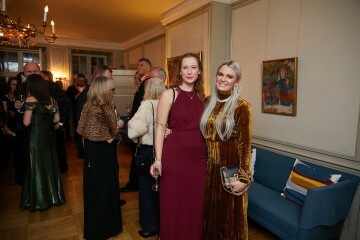 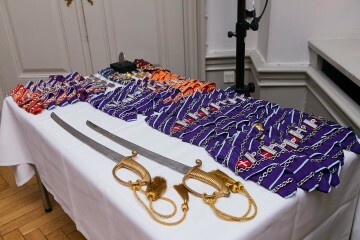 As it was a Chapitre, we started with an Induction Ceremony in the grand salon on top floor of the castle, before assembling in the garden room below for cocktails and canapés. 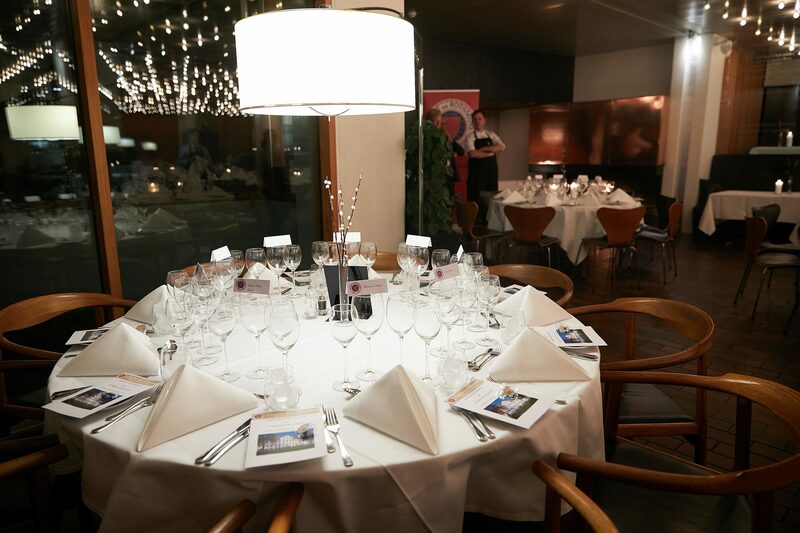 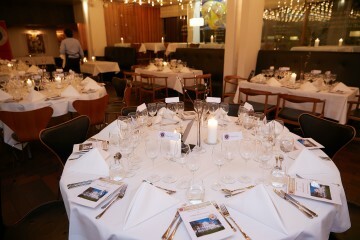 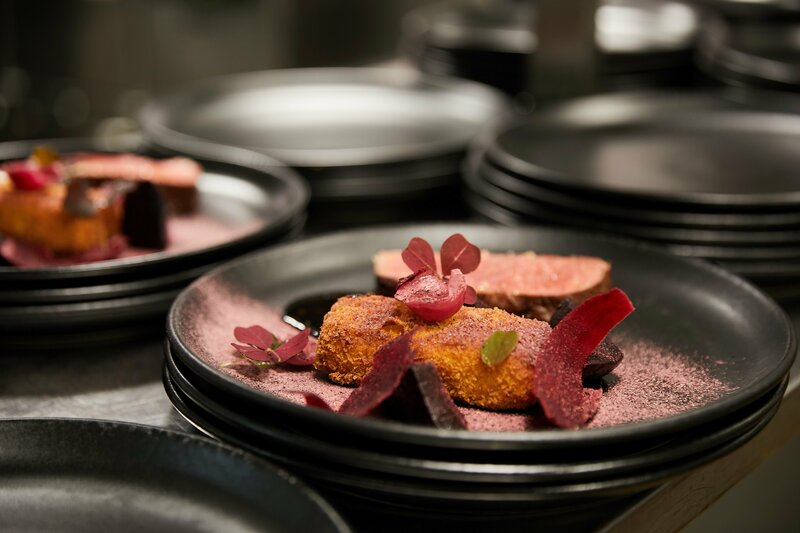 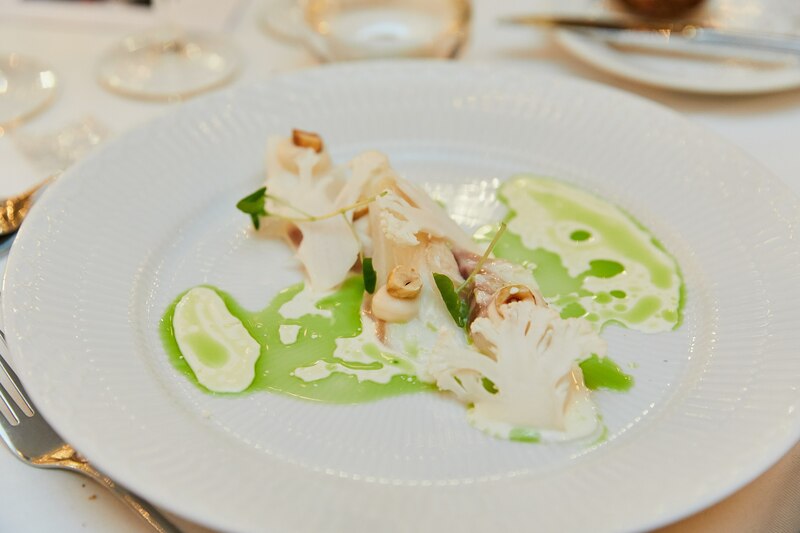 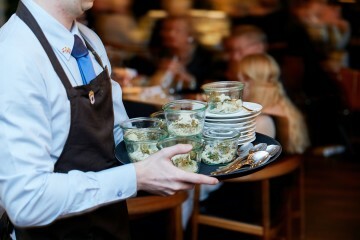 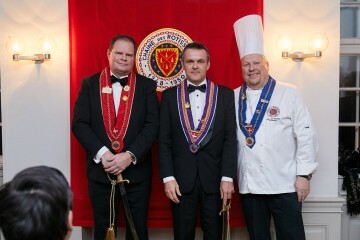 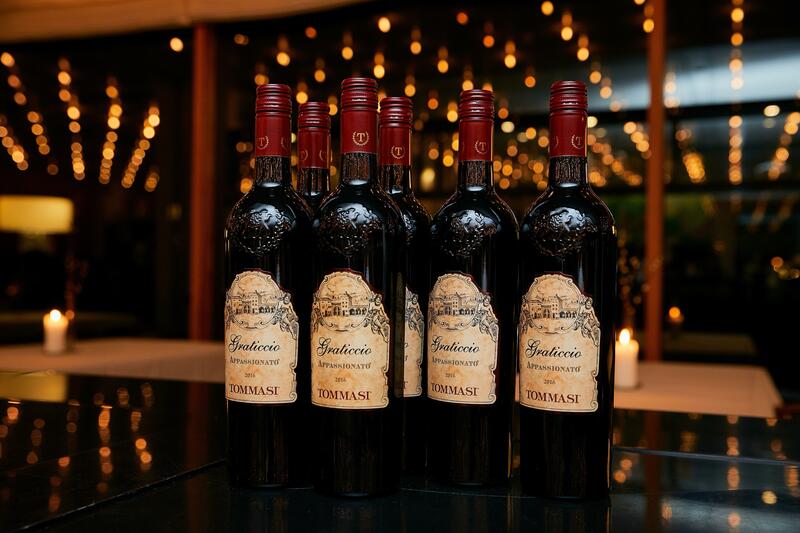 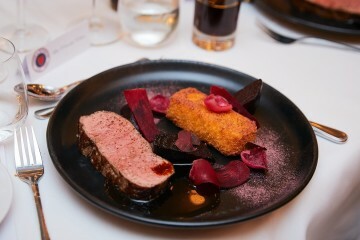 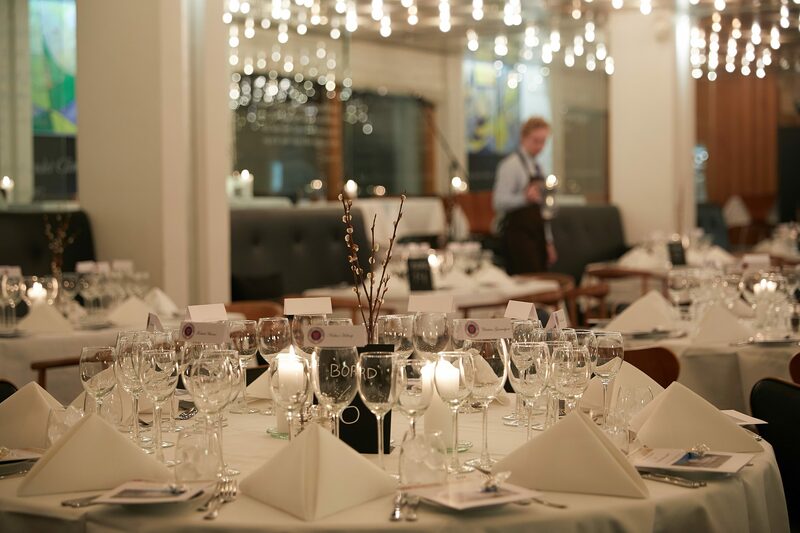 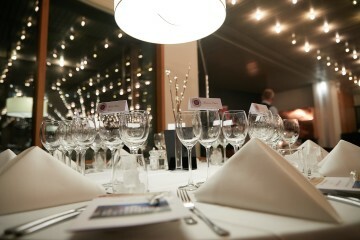 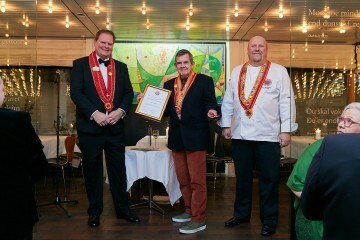 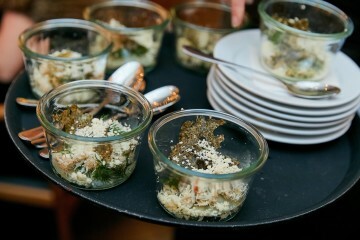 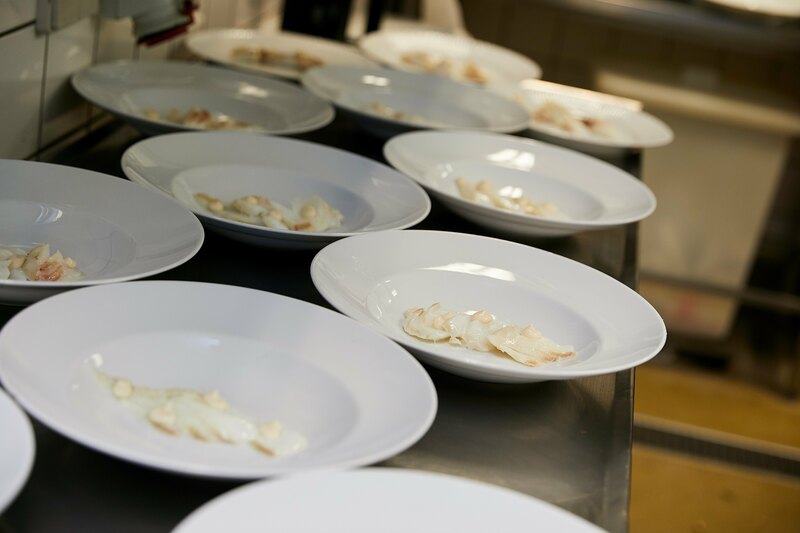 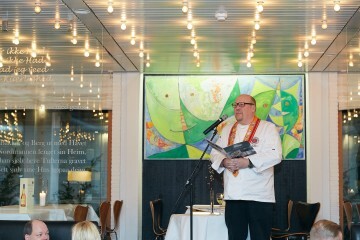 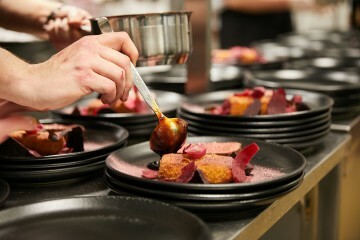 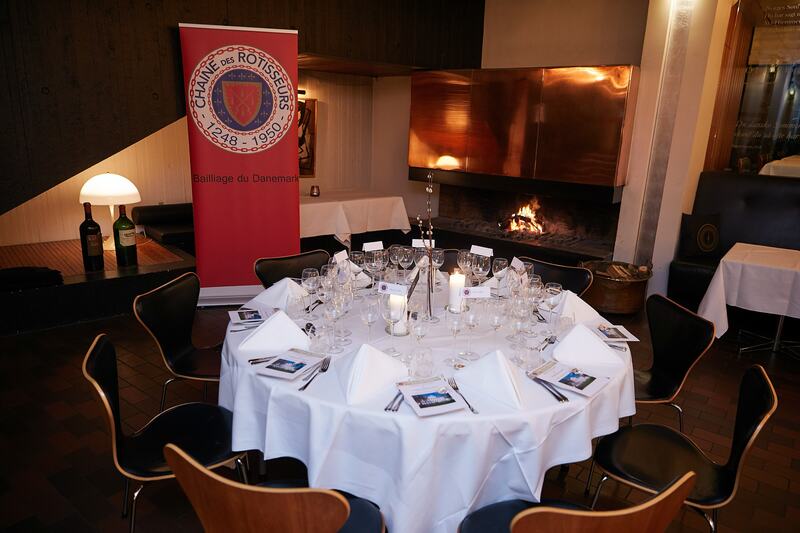 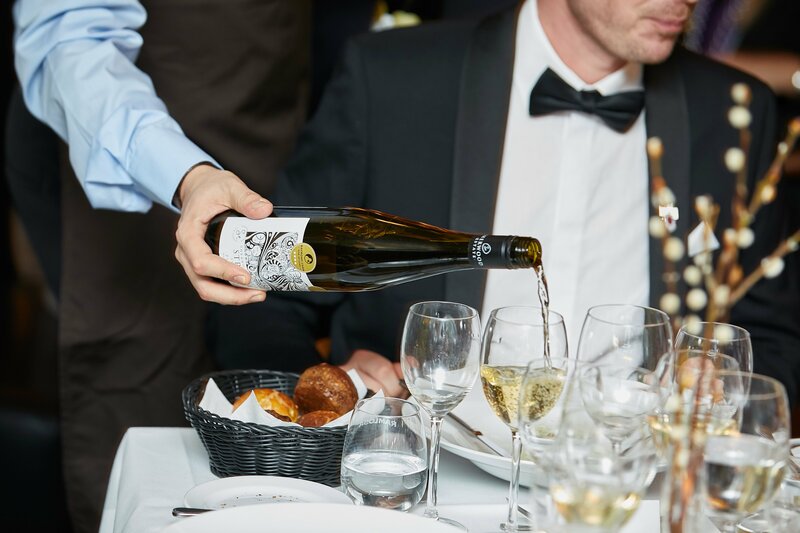 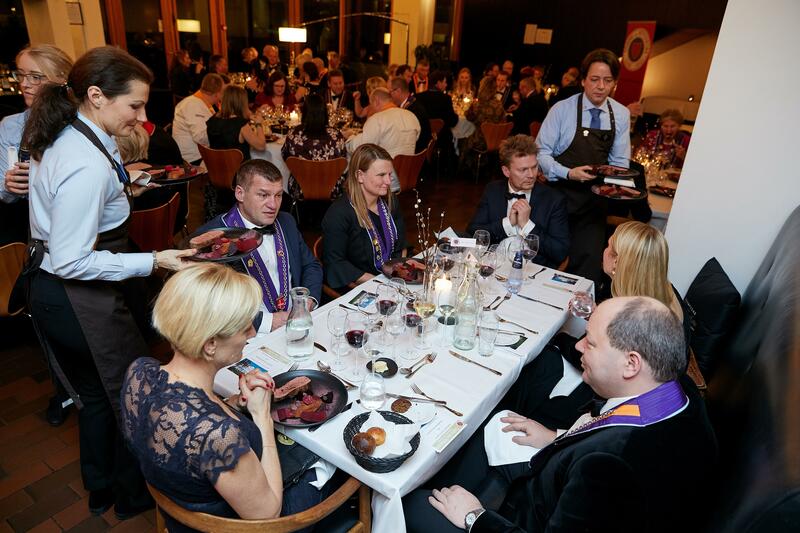 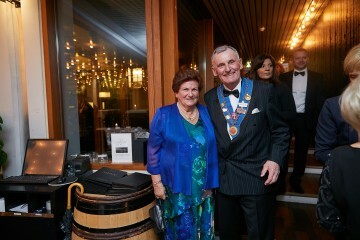 The dinner took place in the Hotel's restaurant – Restaurant Wohlert – under head chef Kristian Lander and his team. 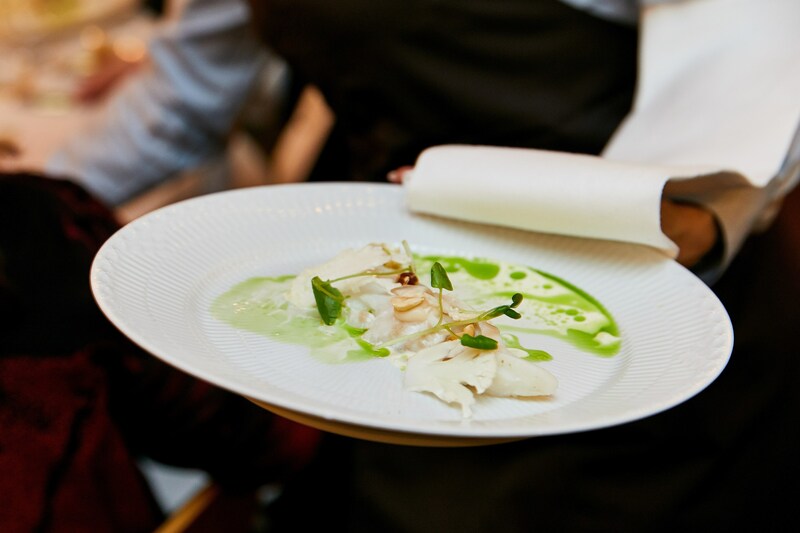 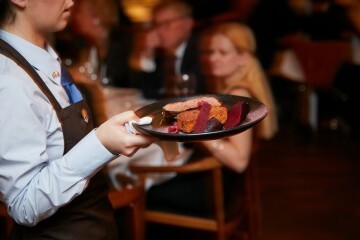 The restaurant has recently won the prize as Denmark’s best ‘ Luxury Hotel Restaurant’. It is renowned for its classic values, good craftsmanship and the combination of contemporary gastronomy with exquisite Danish ingredients from the current season. 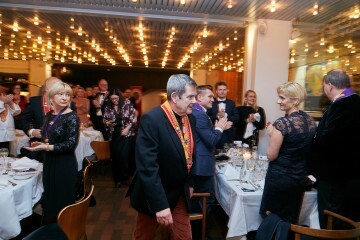 Before the dinner, Bailli Délégué Jørgen Krenk welcomed the many participants, especially the foreign participants from Hungary, Finland and Sweden. 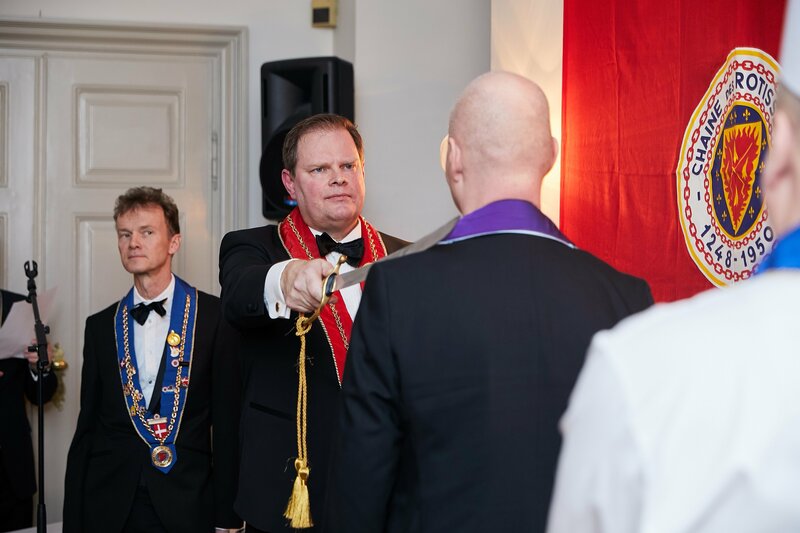 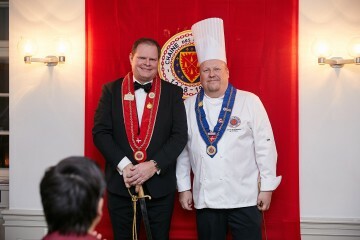 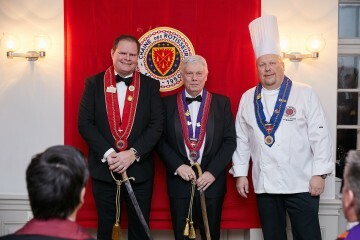 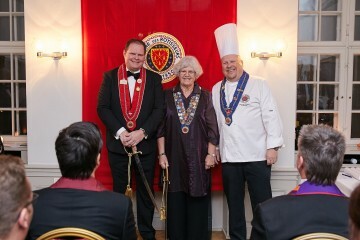 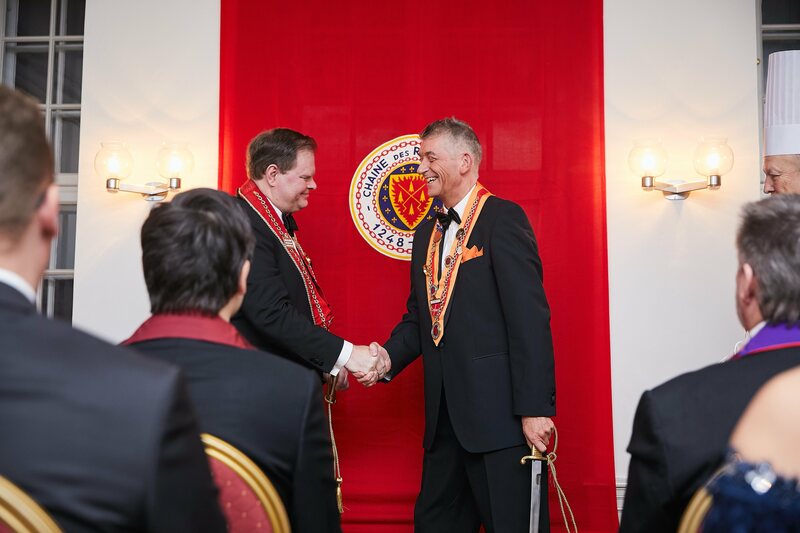 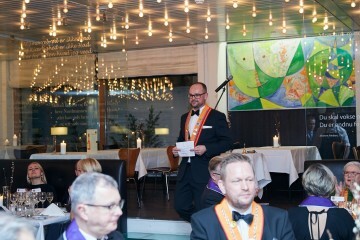 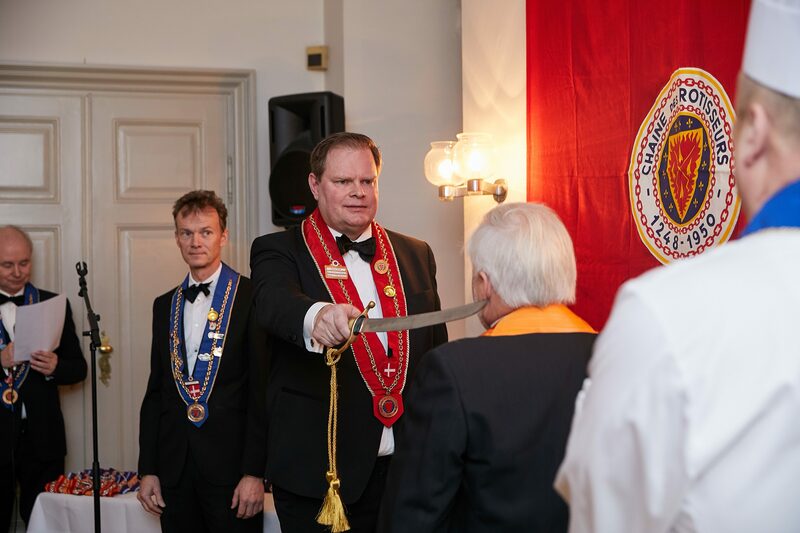 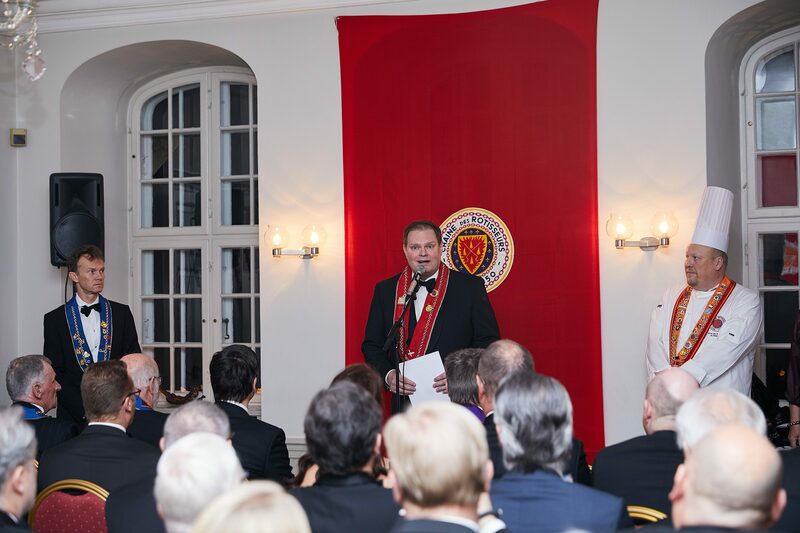 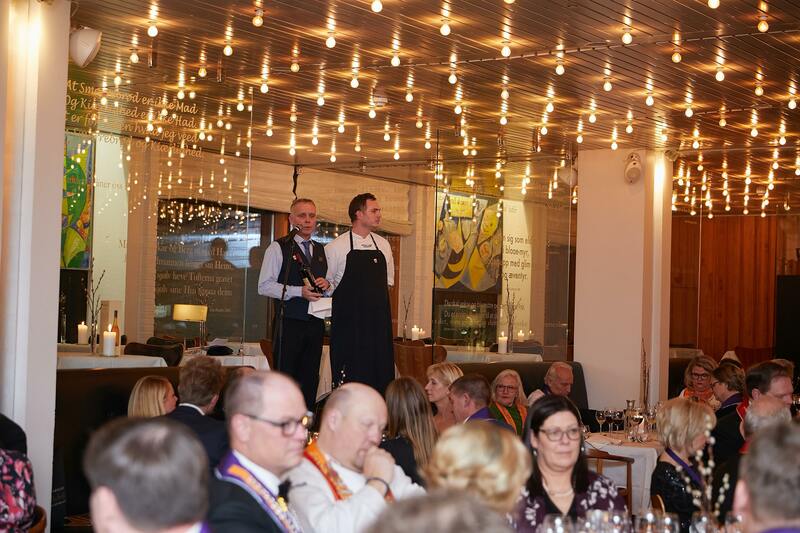 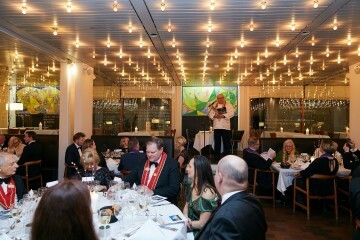 Then Grand Officier Maître Rotisseur Thorbjørn Moy had a short speech about one of the most famous Danish chefs – Maître Rôtisseur Søren Gericke – also present at the dinner. 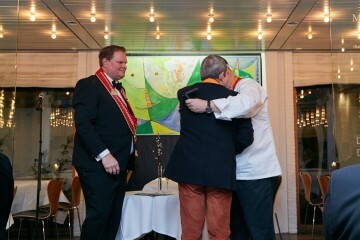 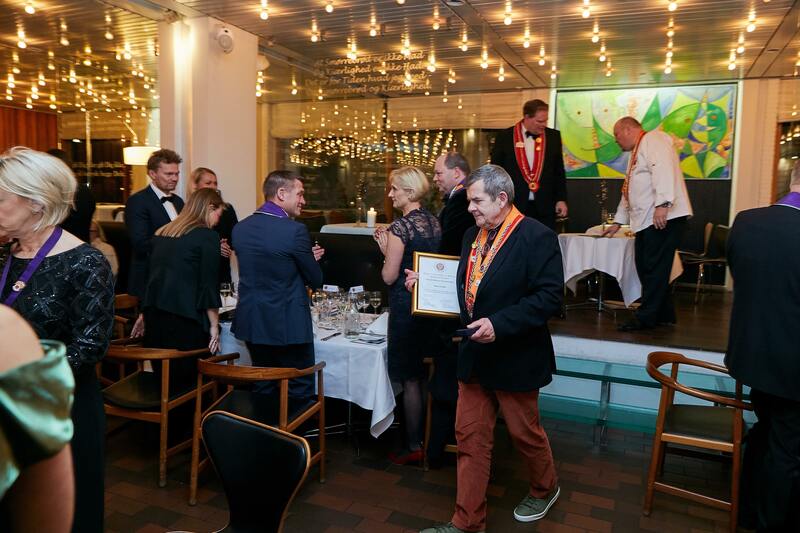 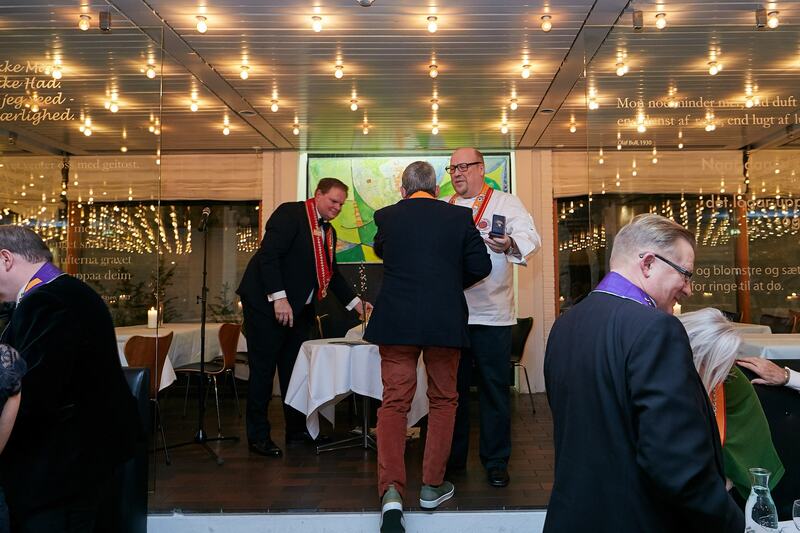 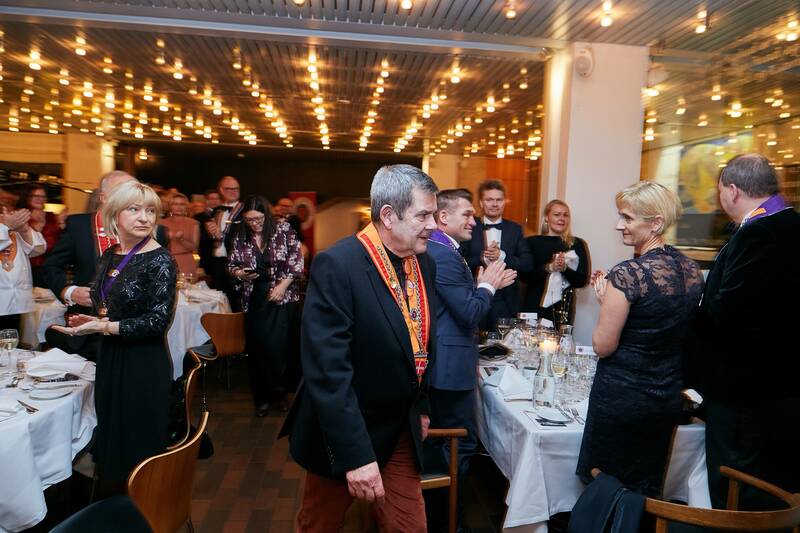 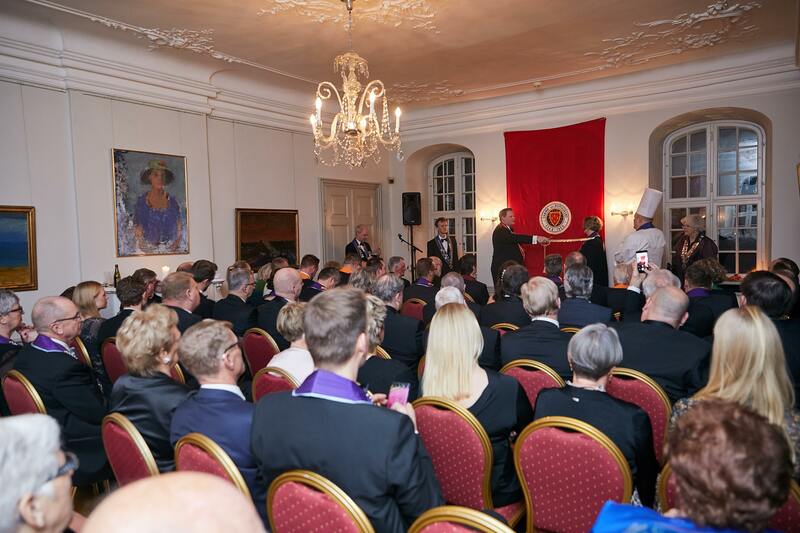 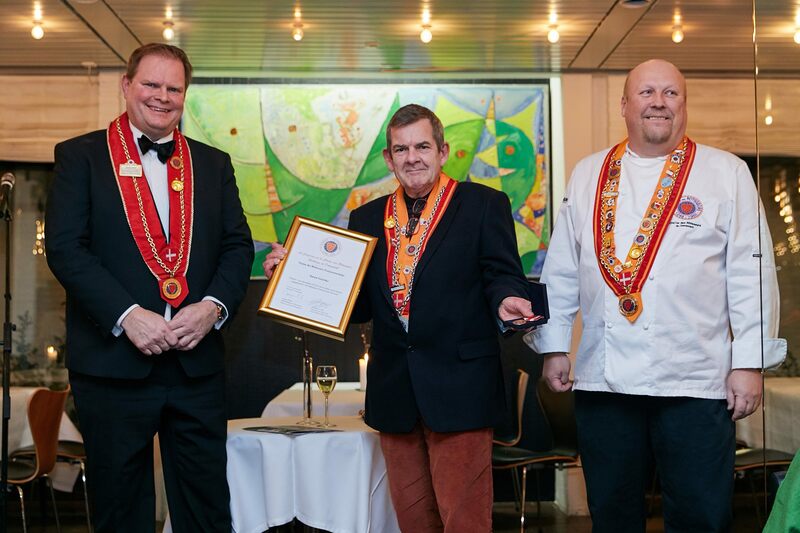 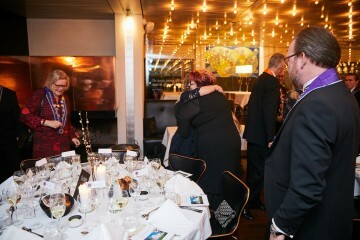 Søren was, to standing ovations and as the first Danish chef, awarded the Chaine Medal of Merit for his lifetime achievements for Danish Gastronomy. 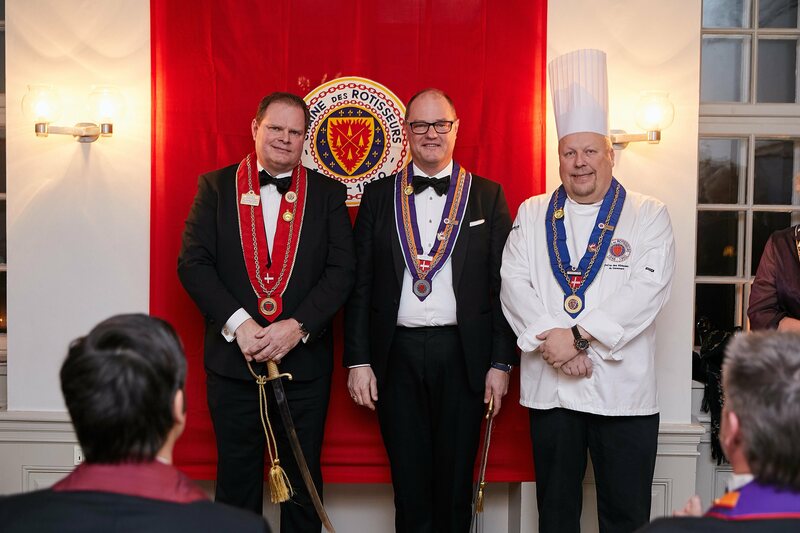 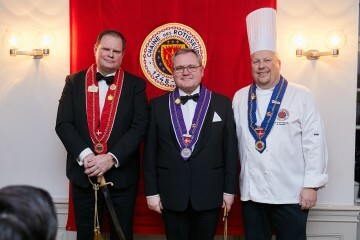 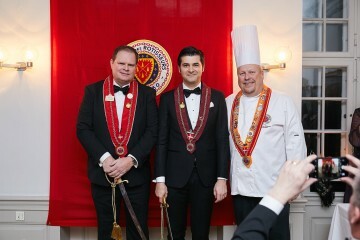 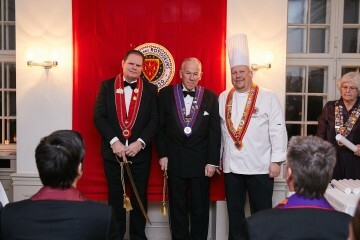 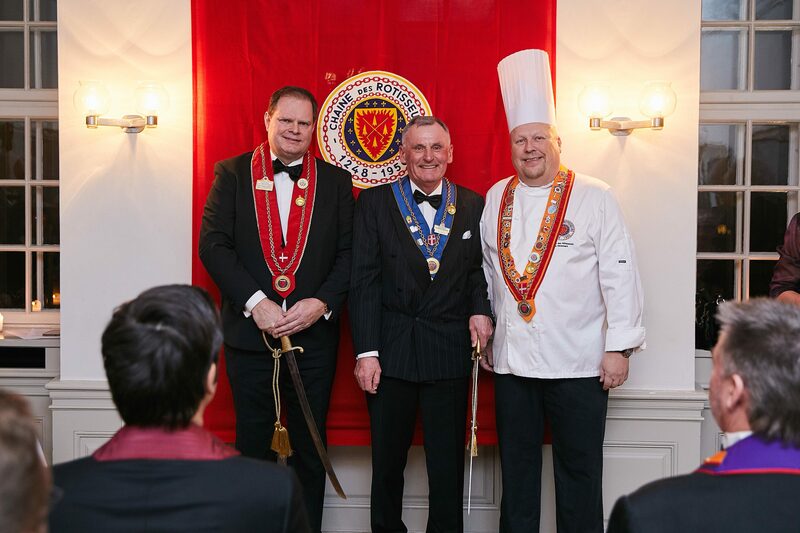 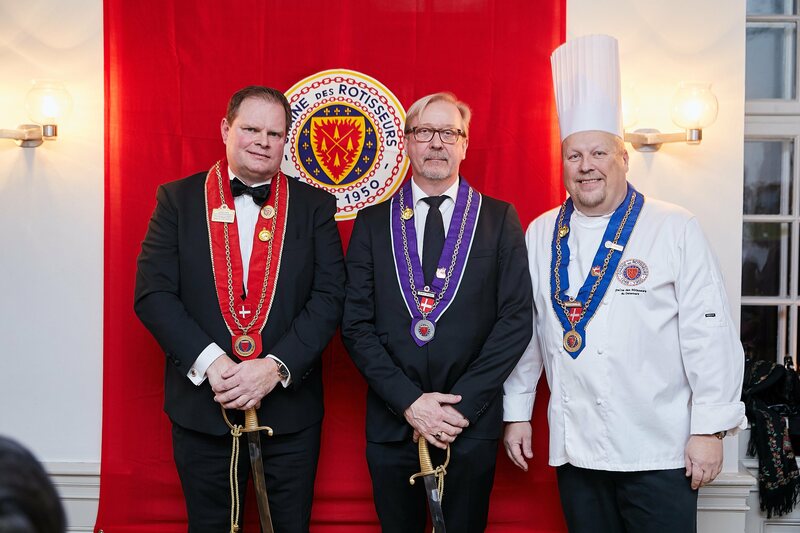 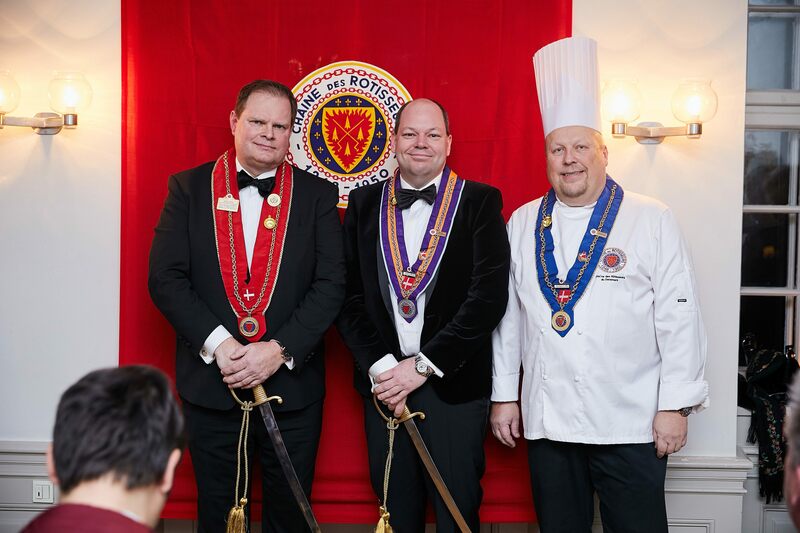 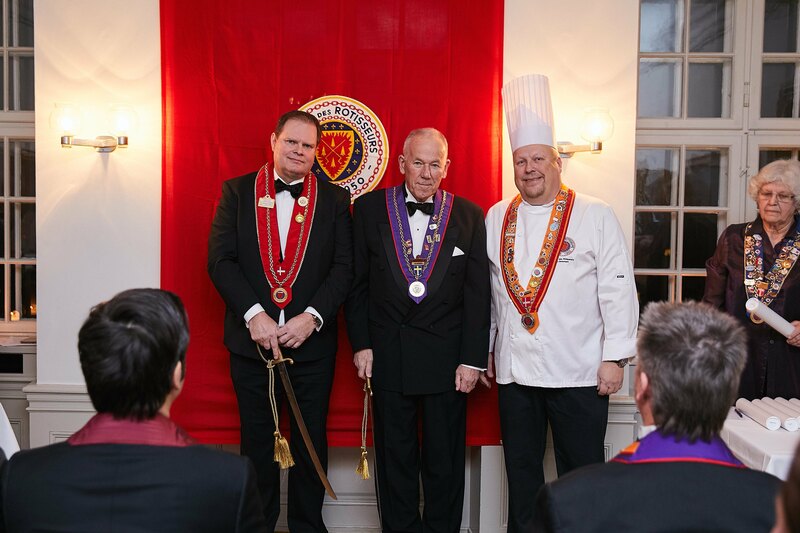 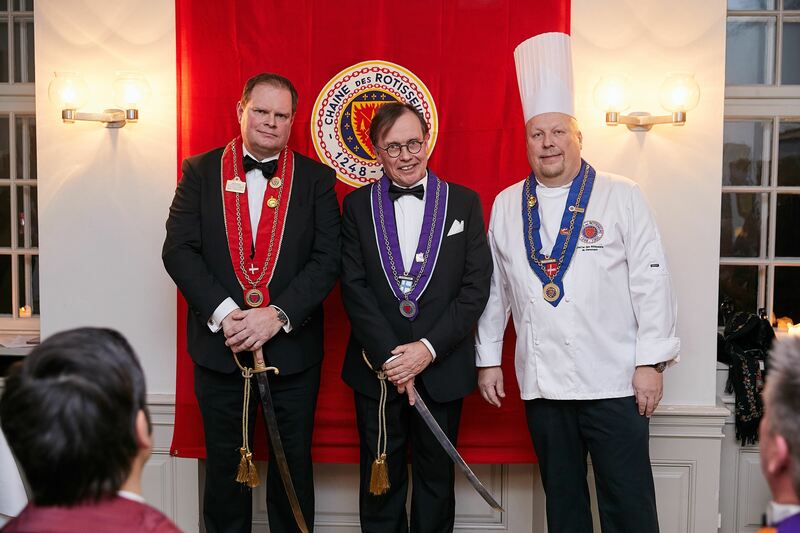 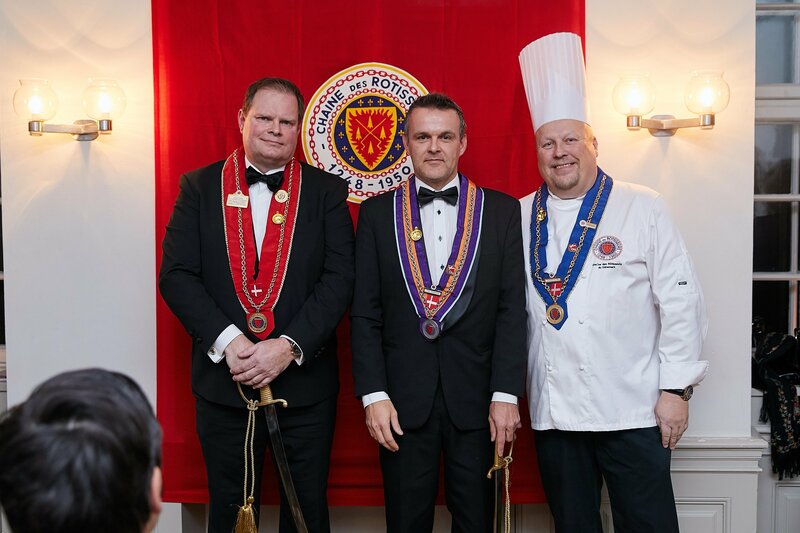 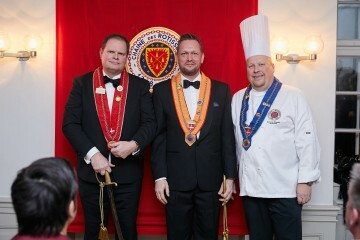 Following the dessert, Grand Officier Maître Rôtisseur Thorbjørn Moy and Echanson de Danemark Jens Steffen Hansen gave their appreciation to the lineup of the staff from the kitchen and the service. 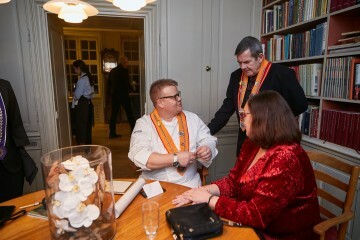 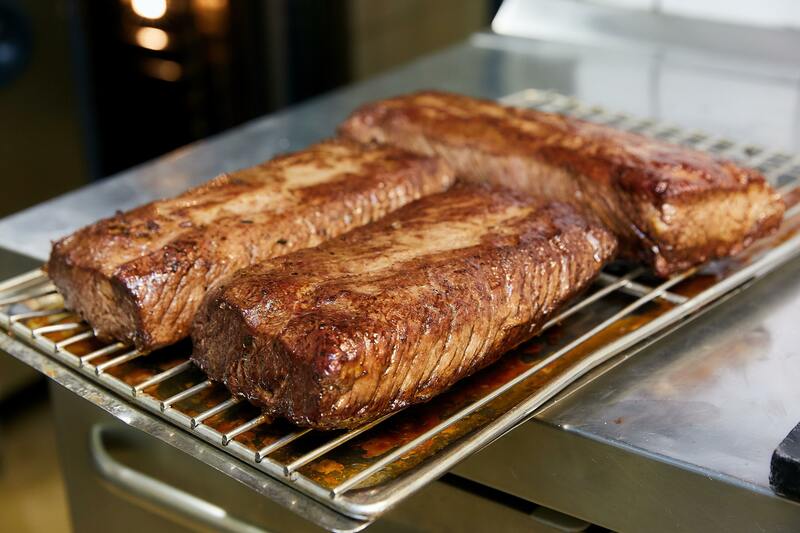 Both were very pleased, as the performance of both the kitchen and the service brigades had been top notch. 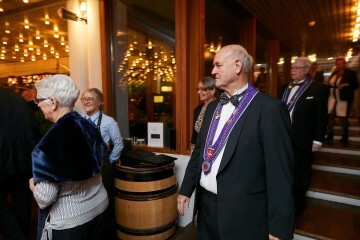 After the appreciation, Bailli Délégué Jørgen Krenk awarded the staff the Danish Chaine service staff pins for a collectively first class service. 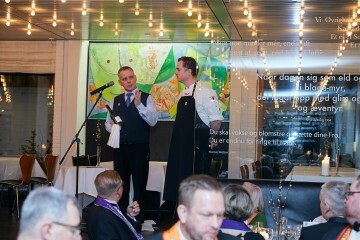 Once again, our main sponsor Ken Storkøkken had an exciting present for us all when we left. 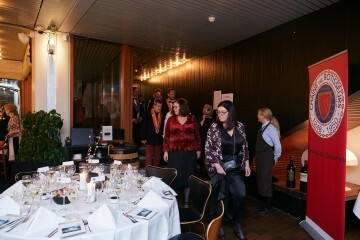 The party ended long after midnight, with everybody was enjoying the fantastic evening at the cocktail bar.